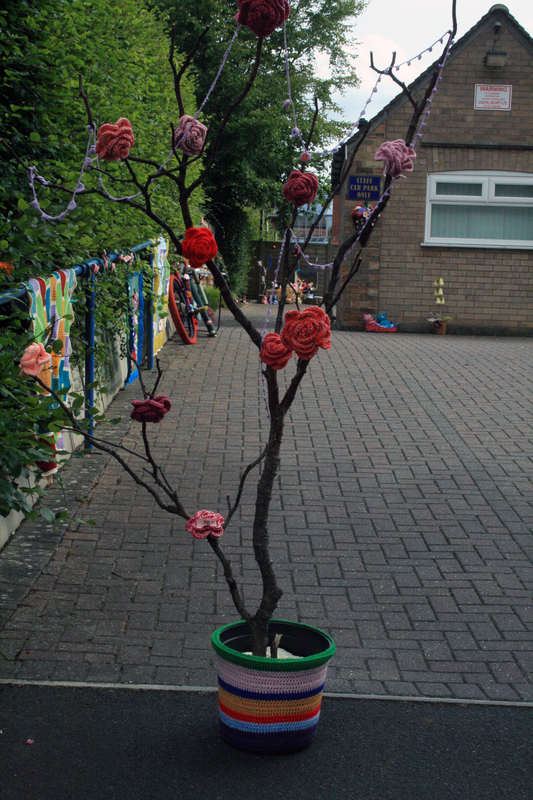 Here is the second part of the yarn bombing. In addition to the five themes we had these gorgeous blankets that were donated by 2 lovely Mama’s. 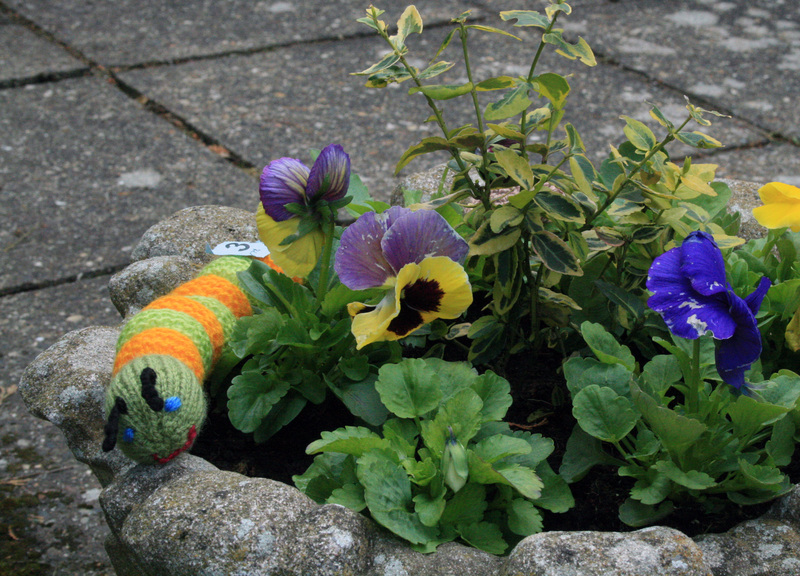 This one is called The Lily Pond and was very generously sent from Mama H, my lovely mother in law. There is so much work in creating a piece like this I don’t know how she could part with it, we offer our heartfelt thanks. 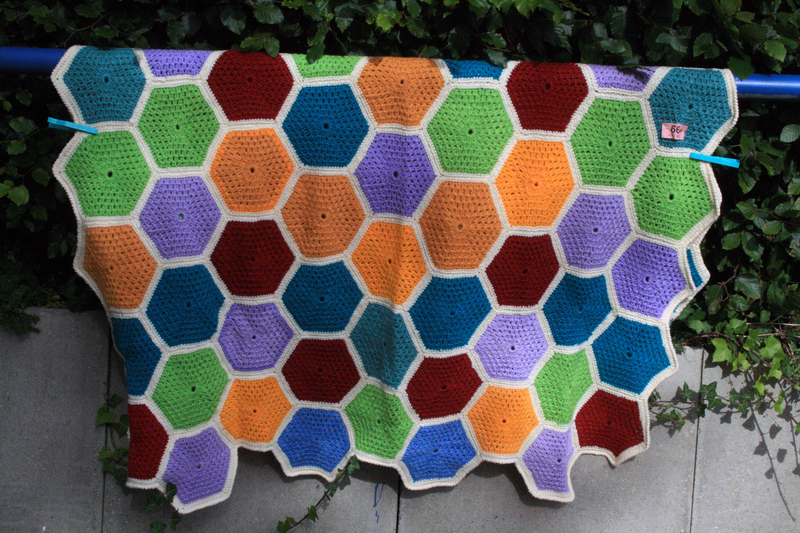 Colourful crochet hexagons make up the second blanket, these were made by my lovely Mum. The hexagons were made from a random batch of yarn and there was an odd number of each colour, this made it quite a task to get the layout right. We had it laid out on the floor so many times before we found a pattern where the colours balanced. I actually joined them all together and edged it and I think it worked out ok in the end. This rose vine was very sought after on the day which was a huge compliment to the creater who fashioned this pretty floral garland out of donated oddments. 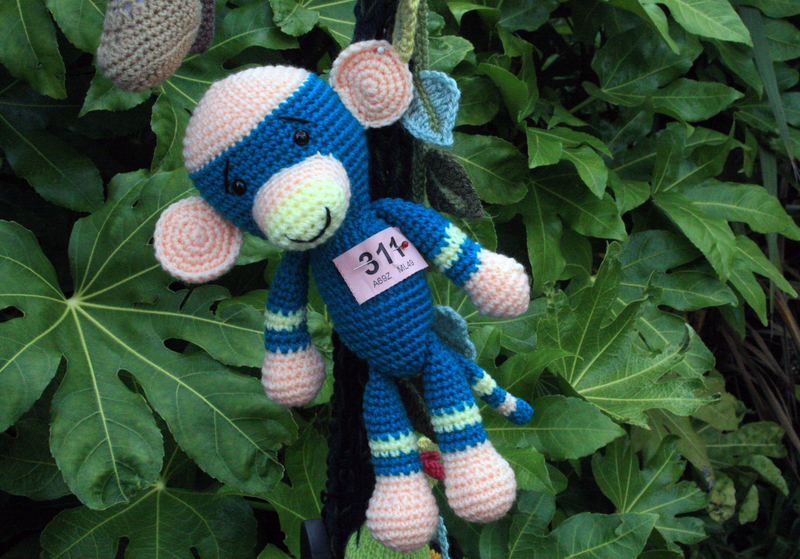 Isn’t it amazing what can be made from scraps of yarn when you pass them on to a talented knitter? 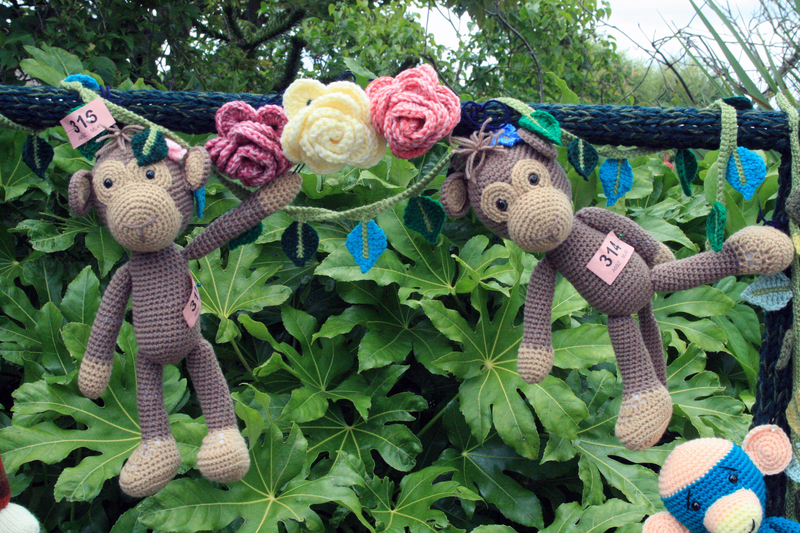 Cheeky monkeys swinging amongst the vines were a feature in the jungle, these twin primates each sported a little flower, one blue and one pink. Don’t know how they managed to keep them in with all that swinging around! “And how clever am I? Look one hand!” His lovely stripes must give him super gripping power. 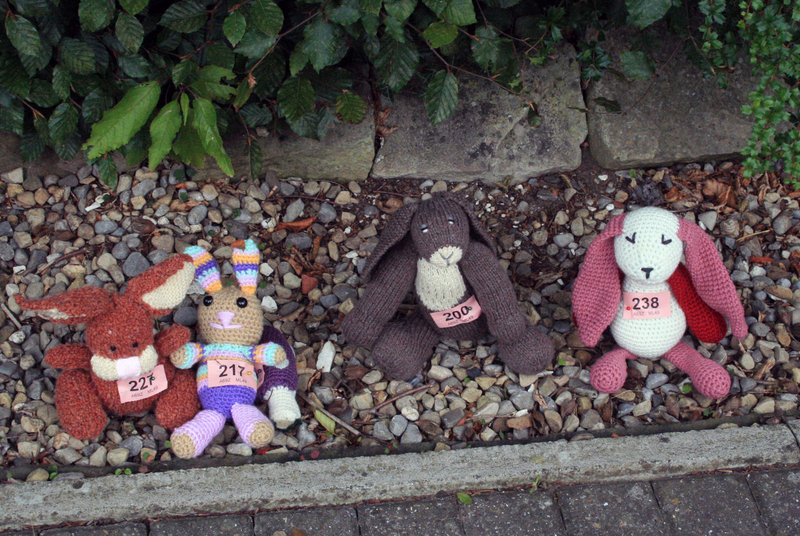 Just in case you are wondering why they all have tickets pinned onto them, we used raffle tickets as an identifier. To make their bid our visitors filled in a form using the number and indicating how much they wanted to offer for the item before slipping it into a sealed box. Slithering below were the snakes in there glorious stripiness. This little critter was soooooooo long. 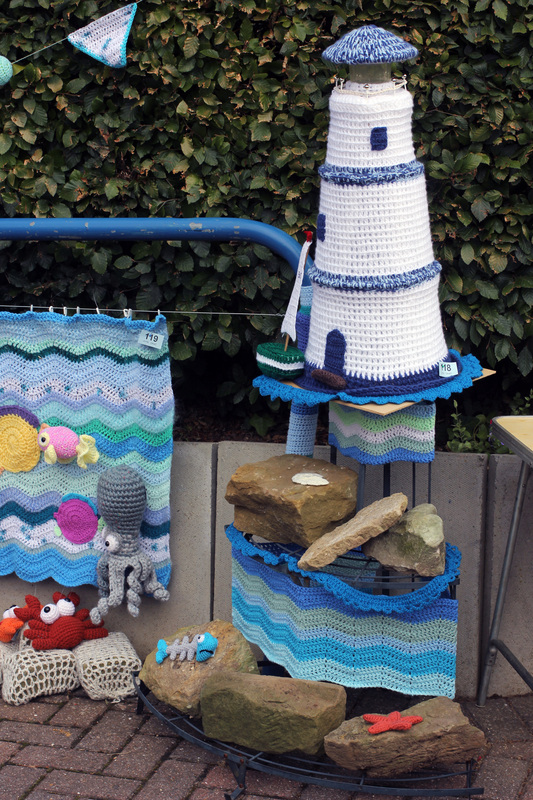 If you saw last years event you may recognise the sea blanket but this year we focused on under the sea adding some more creatures and a trio of lovely mermaids. 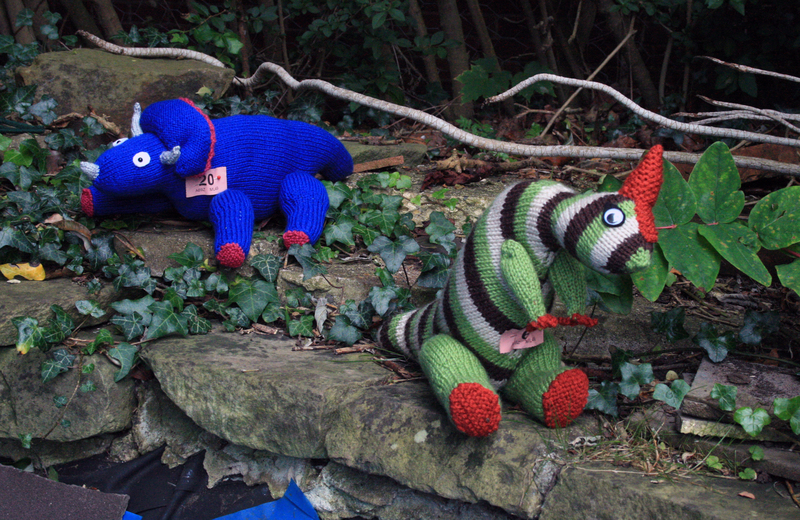 There were three honestly but one of our helpers popped into the pub over the road with a collection bucket and a local fisherman made such a good case for why she should allow him to make a generous offer (too good to refuse) and take her straight away, we were left with two. Their sister was already on her way out to sea on the fishermans trawler! 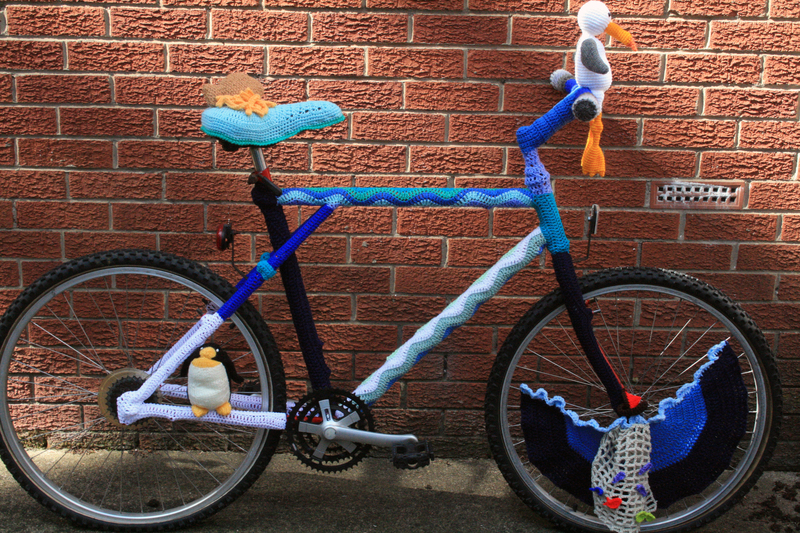 Sorry about the poor photography of the bicycle, I will try and get some better images for another post but for now I hope you can make out the little fishing boat with it’s net cast into the woolly sea on the front wheel. And the fish and chip supper residing on the seat. 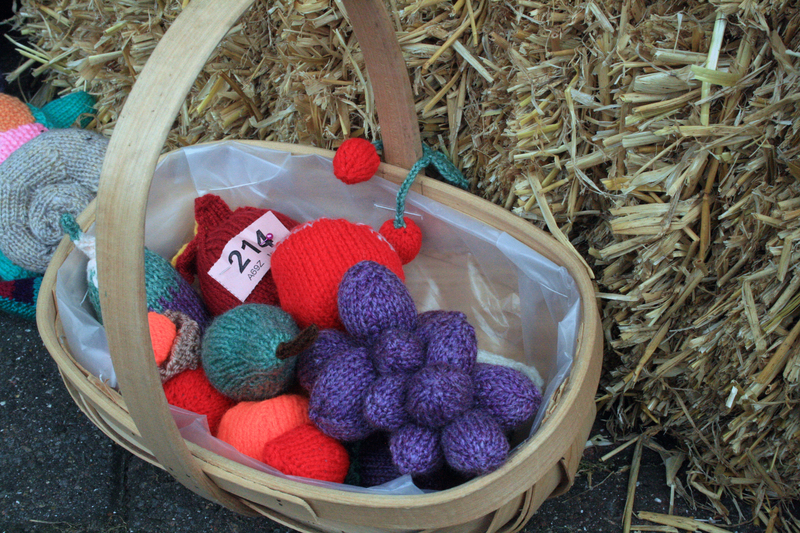 Round by the farm was also a basket of knitted fruits. 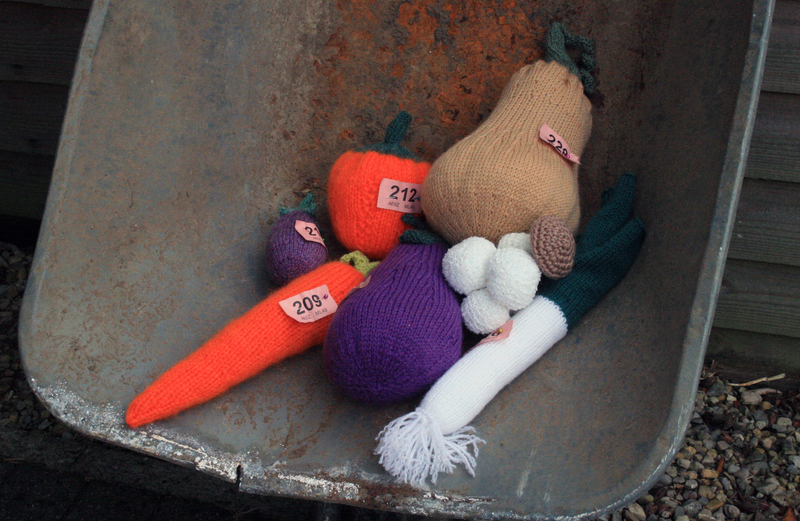 And a wheelbarrow just back from the yarn allotment. 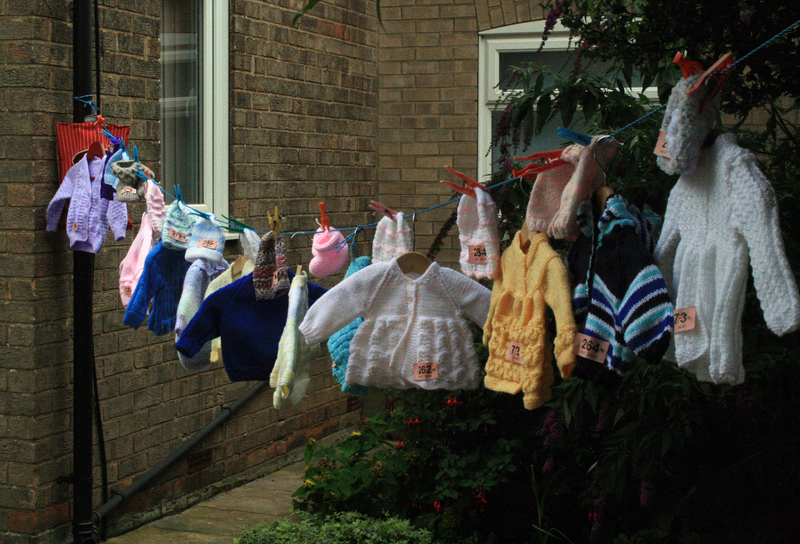 Our event was suported by the local library and their knitting group sent us a several baby and toddler knitwear items. 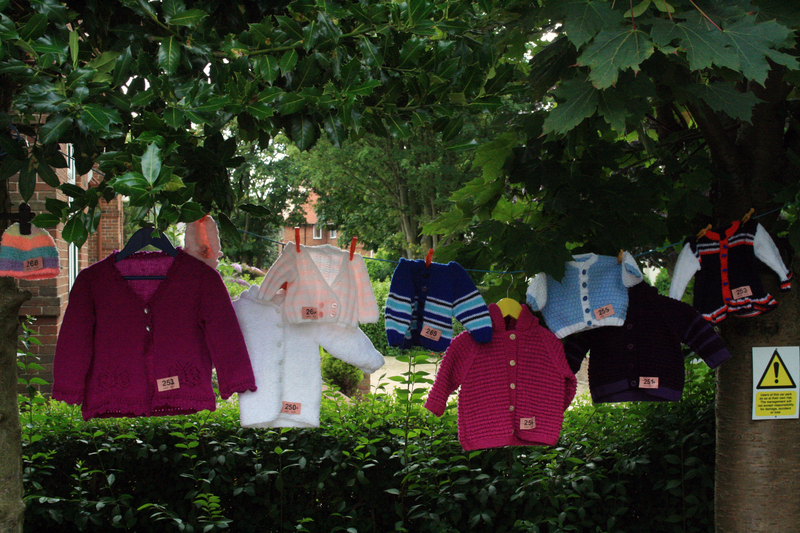 Also the sister of one of our dispensers is a prolific knitter, she sent us some gorgeous jackets and cardigans, I think we must have received one a week! Thank you. 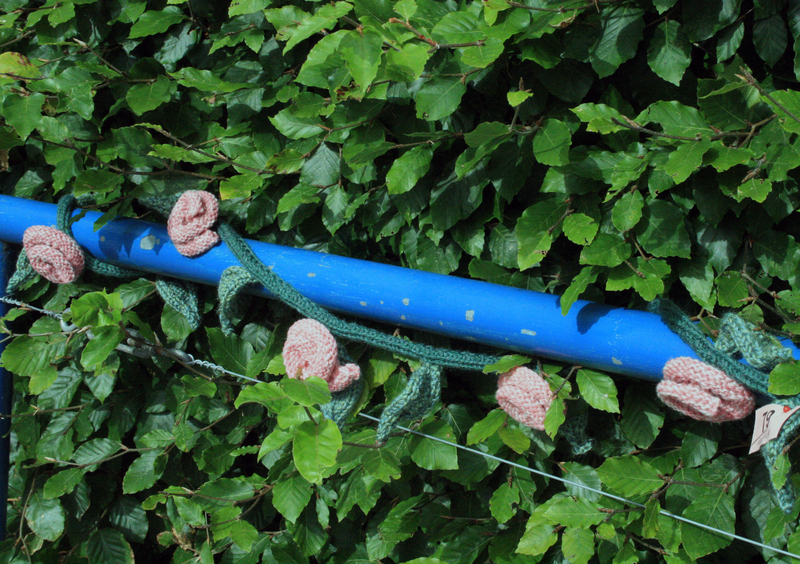 We strung up a washing line and pegged out these hand knitted garments. 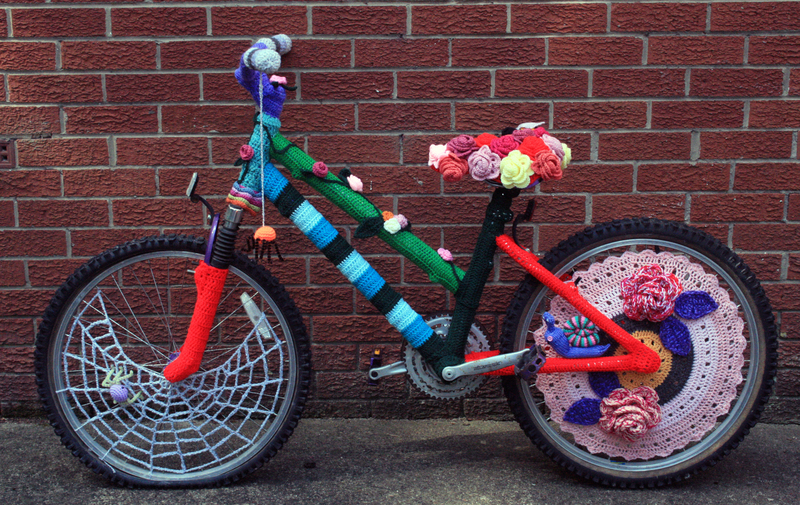 ………….. a country garden crochet bicycle. This shot was taken outside our house before it was transported to the surgery where it stood against the tree to attract passers by. The event was a lot of work but so worthwhile on many different levels, it brought together patients, staff and friends of the surgery at our crafty Saturday morning gatherings. 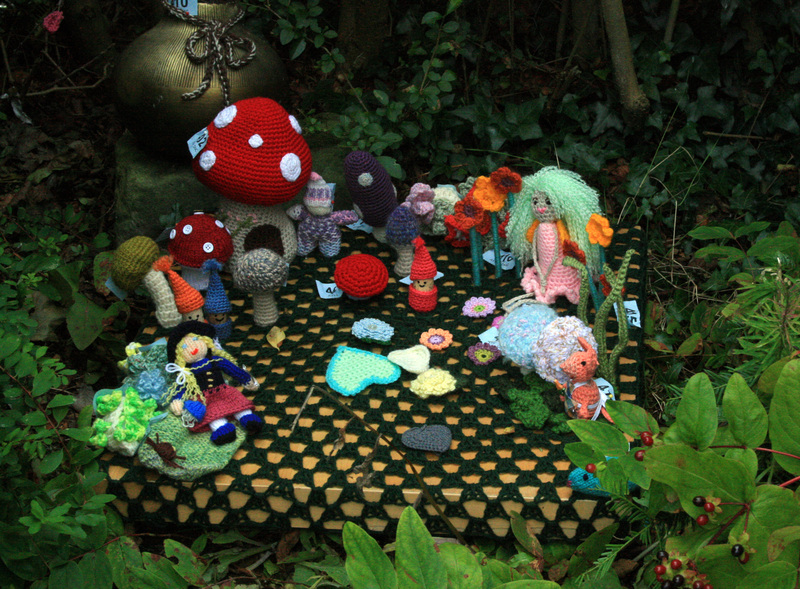 So many patients who couldn’t attend joined in by dropping into the surgery with yarn for us or with items they had made for one of the themes. We were also very generously supported by the blogging community so thank you to all of you too. For those who followed the project last year you will know we are a small GP surgery on the beautiful coast of North Yorkshire. 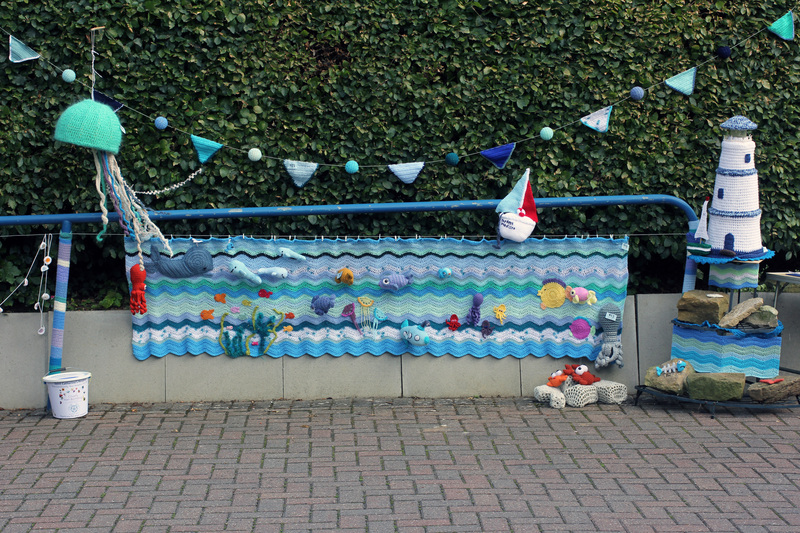 We have a group of patients and friends of the surgery who love crafting with yarn, following the sucess of the yarn bombing last year we ran the event for 2015 following a similar format for but with some new themes. I had my doubts about including dinosaurs anticipating it would be limiting in terms of patterns, couldn’t have been more wrong as you can see. 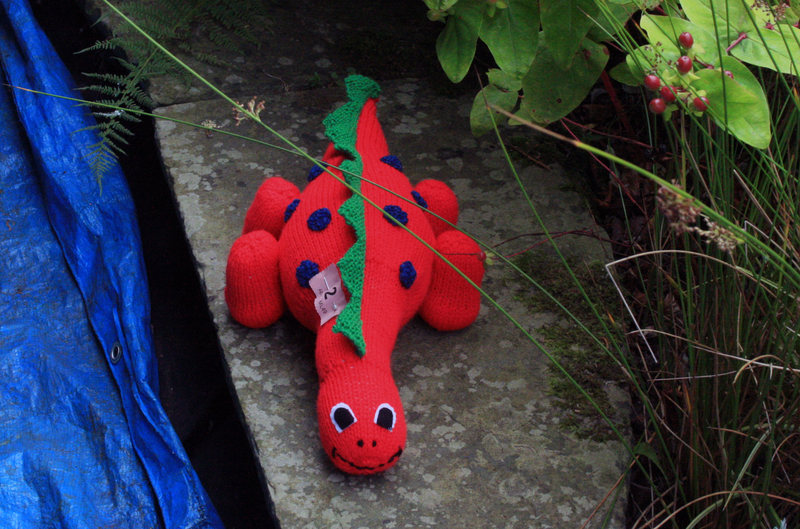 We had quite a few knitted prehistoric deliveries both large and small. 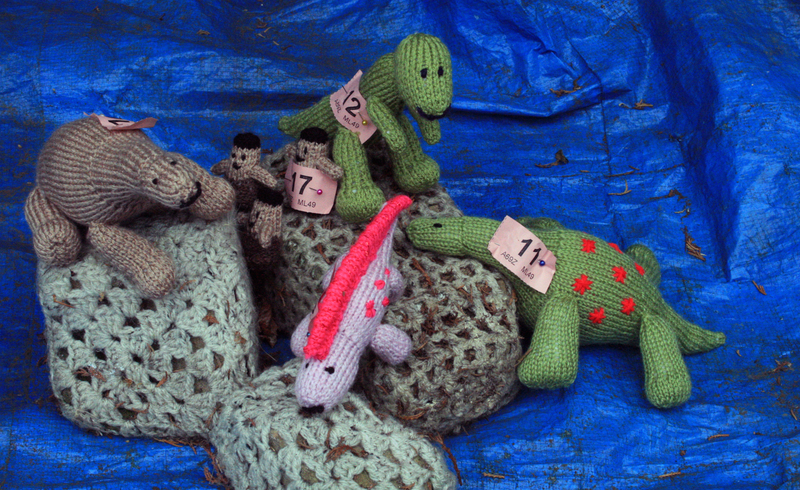 Lots of dino’s for our park in a variety of sizes from the miniature 4-6 inch creations above that patients brought in. 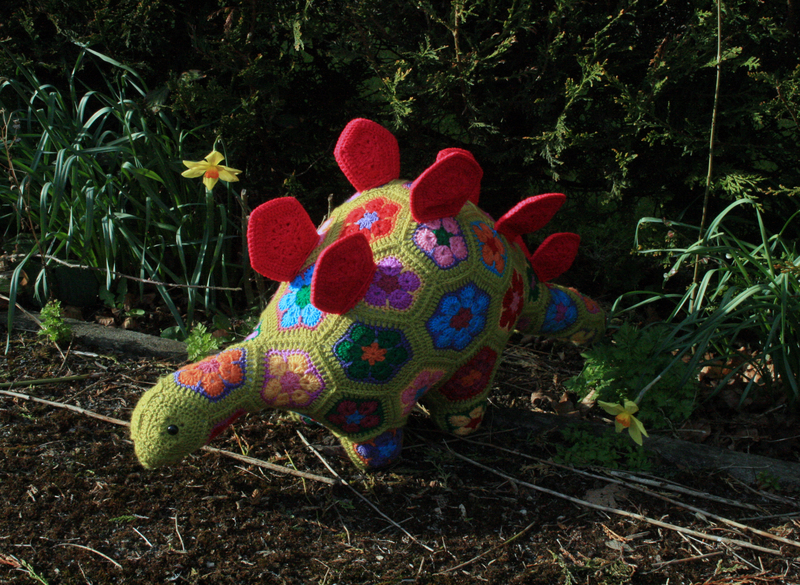 To the rather large Stan the Stegosaurus who you may have seen in a previous post where I shared the working progress of creating this colouful prehistoric creaature. 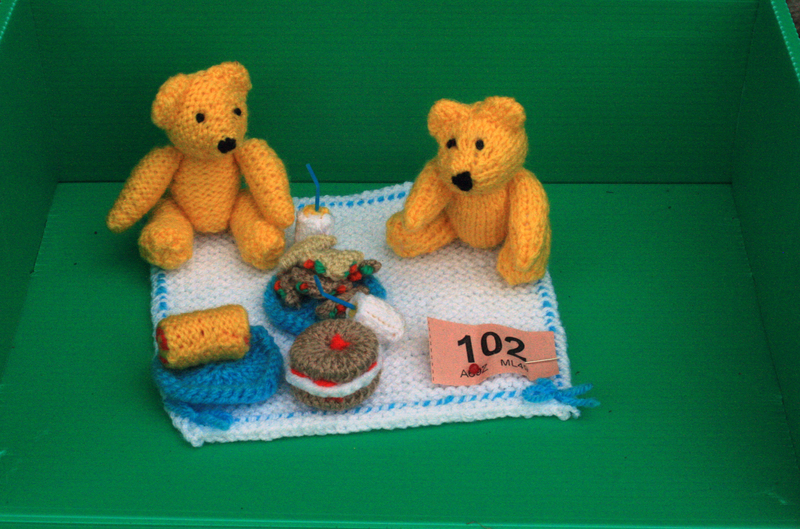 This was one of my favourite pieces, you can see from the size of the raffle ticket just how tiny these little teddies are, they sat on their little picnic blanket contemplating their miniature sandwiches and cakes throughout the weekend. As I am sure you can imagine they were one of the first items to receive a bid. 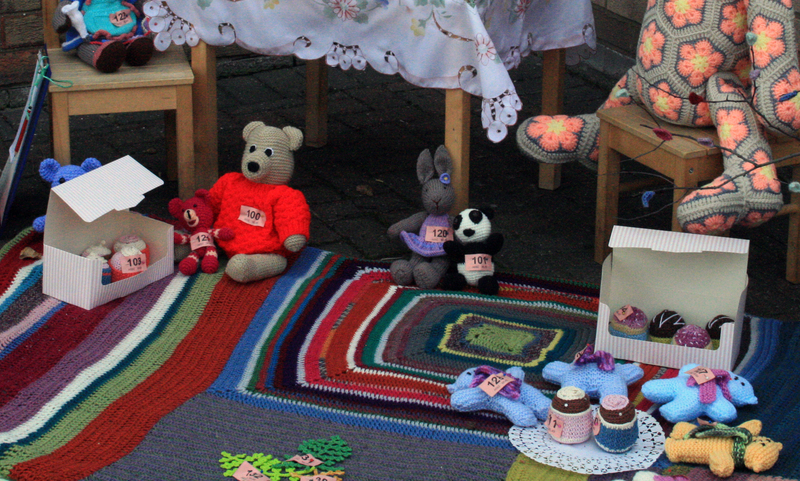 There was an array of little woolly bears and teddy toys gathered in the picnic corner to share in the knitted and crochet cakes, biscuits and sanwiches including Mrs Baker Bear sat on the chair with piping bag in hand to finish off the last bun. 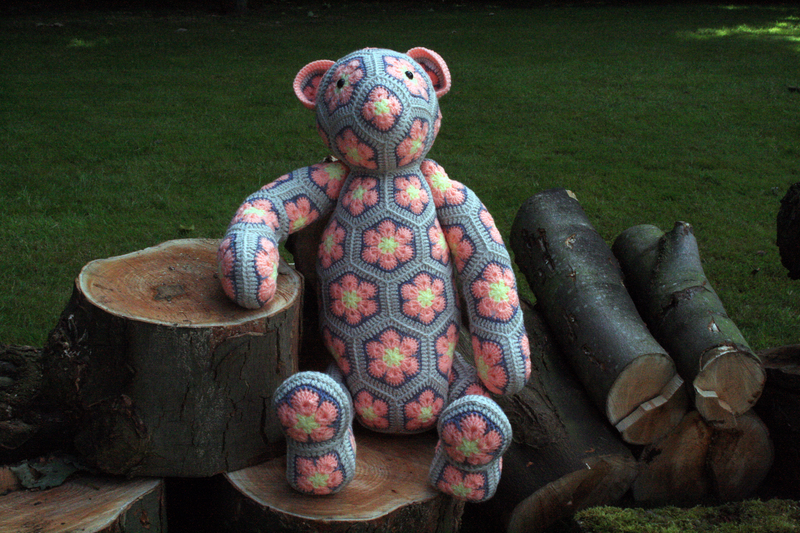 Rollo the african flower bear settled down amongst the log pile for a snooze after devouring his fill of the picnic. 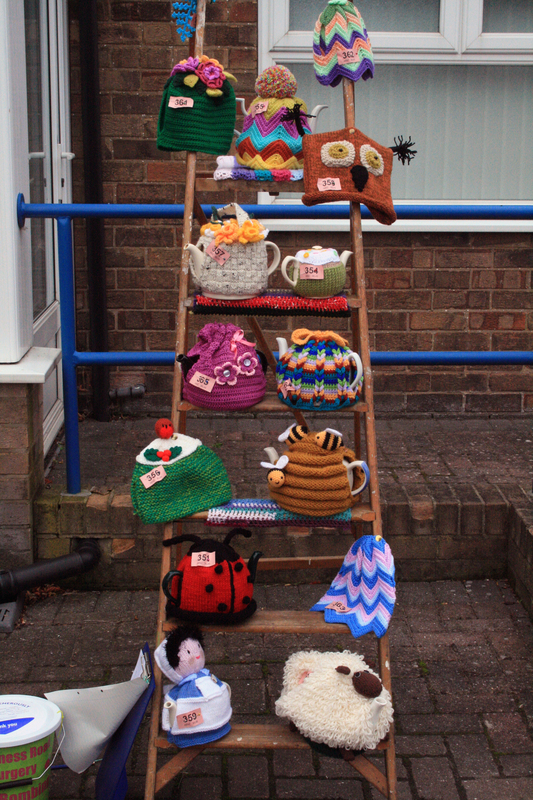 To sit alongside the picnicing bears we had a stand (ok and yarn bomed step ladder) laden with tea cosies. These were a very popular contribution to the event, it must be in celebration of the great british brew! One of our group particularly requested we include a Farm theme this year, she had a new book by Sarah Keen that she was dying to try and we were so pleased with results, you can almost hear those little piggies snorting. Our Parctice Nurse managed to aquire a hay bale for us to display our farmyard creatures, I was thrilled but my lovely hubby was less so as I used his car to collect it! Four weeks on and he has just about got the last of the straw removed from his car boot. 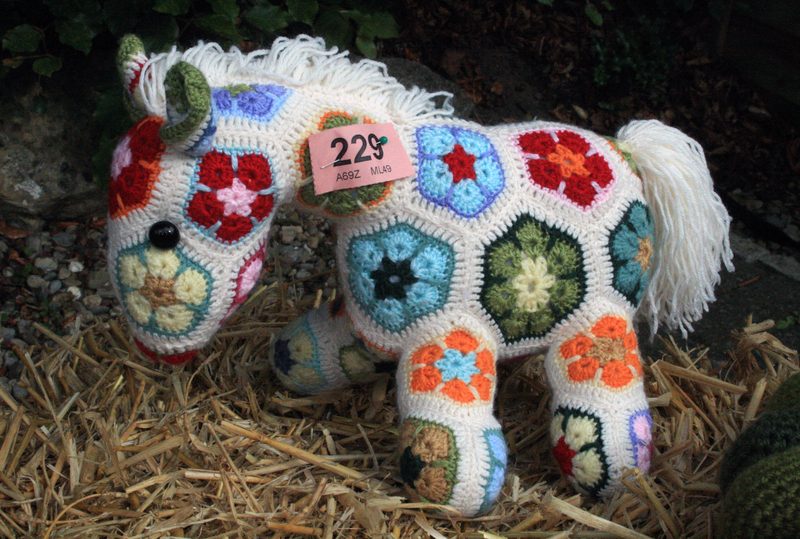 A patient kindly donated this gorgeous african flower horse, I believe it is from the Heidi Bears pattern but sadly the donator remains anonymous so I cannot be sure. 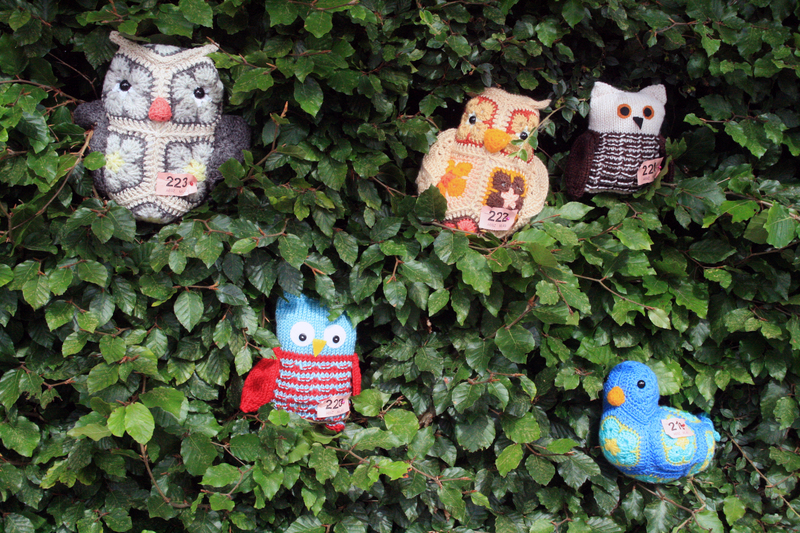 We also had a gathering of owls nestling in the bushes casting their wise eyes over the weekend proceedings. 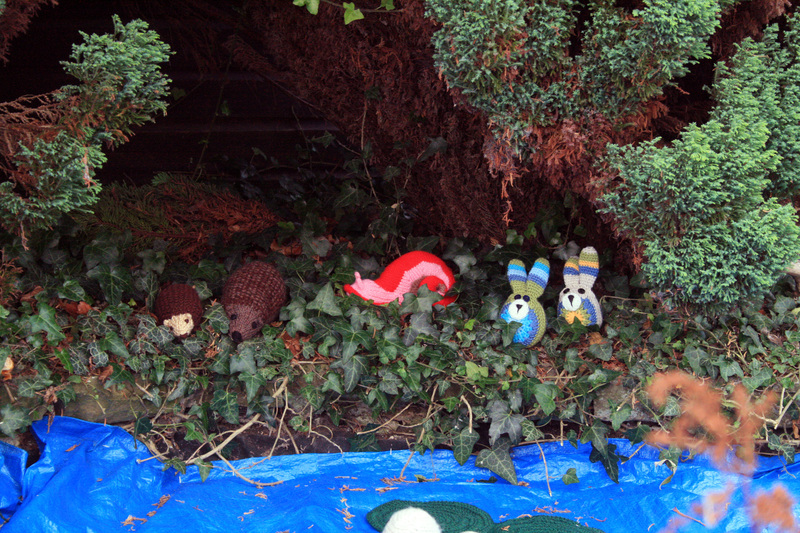 And in the hedgerow below gathered a collection of bunnies and other creatures. 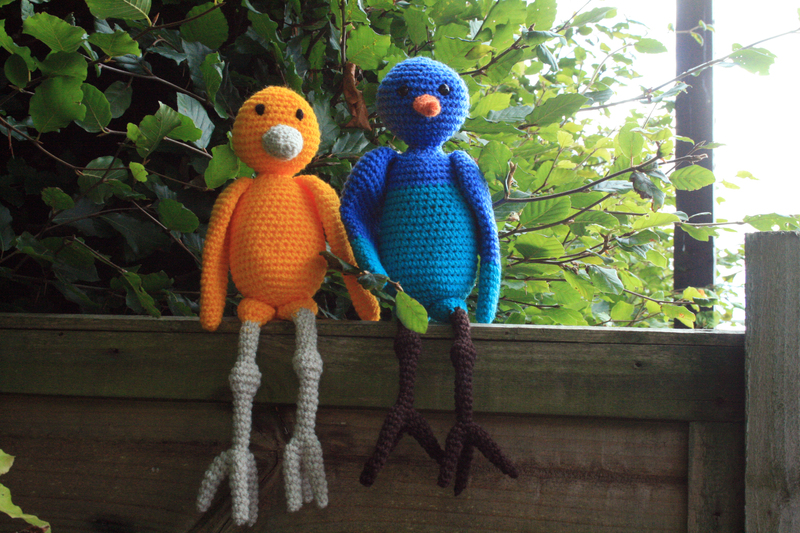 And birds simply sat on the fence watching the world go by. I don’t want to bore you so will call this post part 1, I will continue working on compiling the other half of the images to post early next week. I am working tomorrow as we are open for our first Flu clinic, it is always a bit crazy at this time of the year when everyone wants to get their vaccination done early to protect against catching a flu bug! 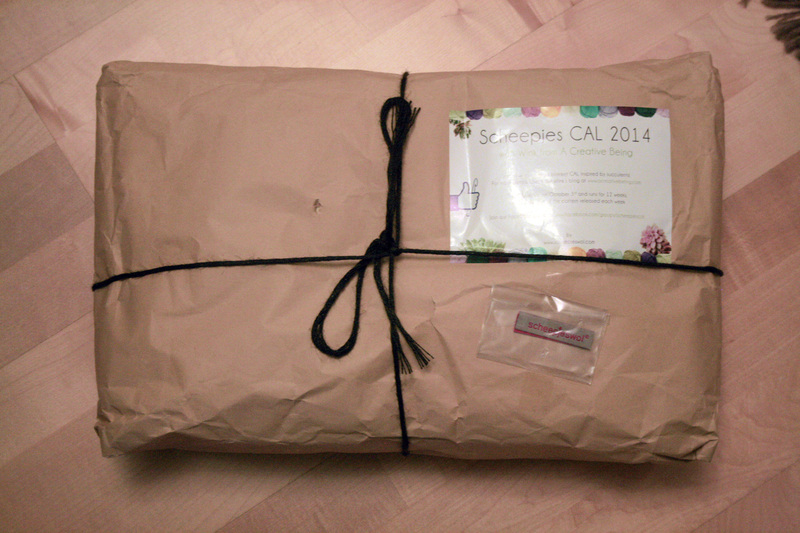 Scheepjes CAL 2014 – I just couldn’t resist it! I was so excited when my parcel arrived. The Deramores website said it could take up to 28 days but you can imagine my delight when just two weeks later it appeared. 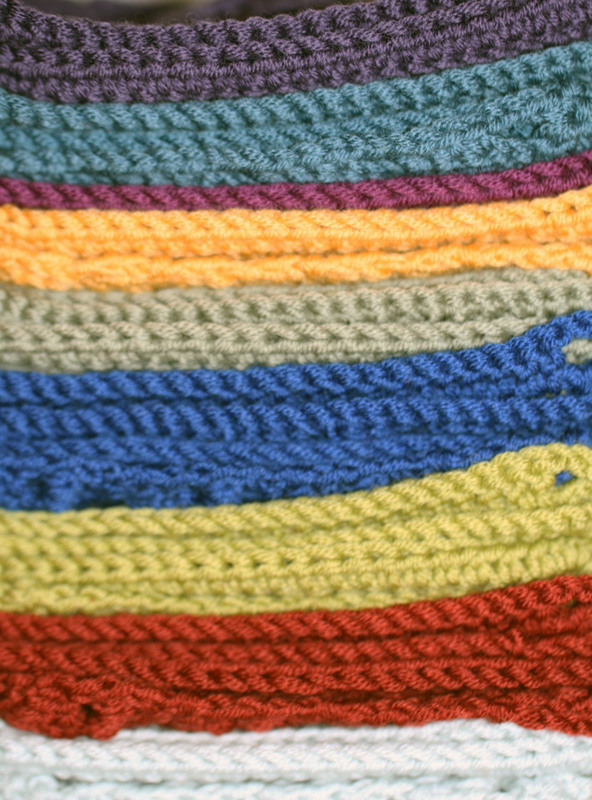 An array of 12 gorgeous colours in a soft velvety cotton yarn. Sadly lighting is an issue for me and my photography skills so this shot doesn’t show the truly beautiful shades at their best. These are the squares from weeks 1, 2, and 4. I couldn’t resist the little flower centred square so missed week three and skipped straight to week 4. A bit naughtly of me but I will catch up soon, I am sure I will be forgiven for going out of sequence. As a late starter on this project I am running behind anyway but who’s counting? I am just loving every minute of it. 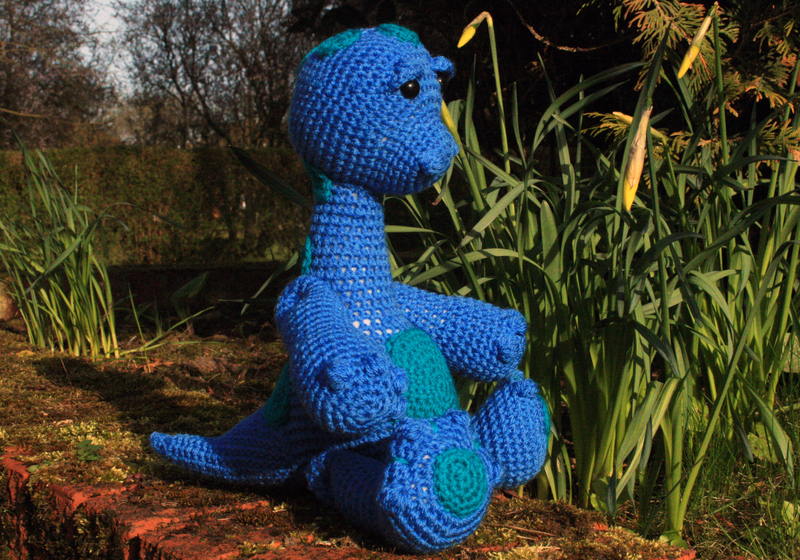 I have kept the colours fairly simple so far but I am itching to do a stripy one next………. The seaside scene was really spectacular but I found it was the hardest to photograph because of the size. To give it some perspective the stretch of railing that it s dressing is 4 metres long. To get the whole thing into view it lacked detail so I will have to ask you to use your imagination a bit. I really regret not taking more close-up shots. I had to wear a wrist support for a week after making two thirds of the sea blanket and was extremely grateful to Debs for taking over and finishing it. 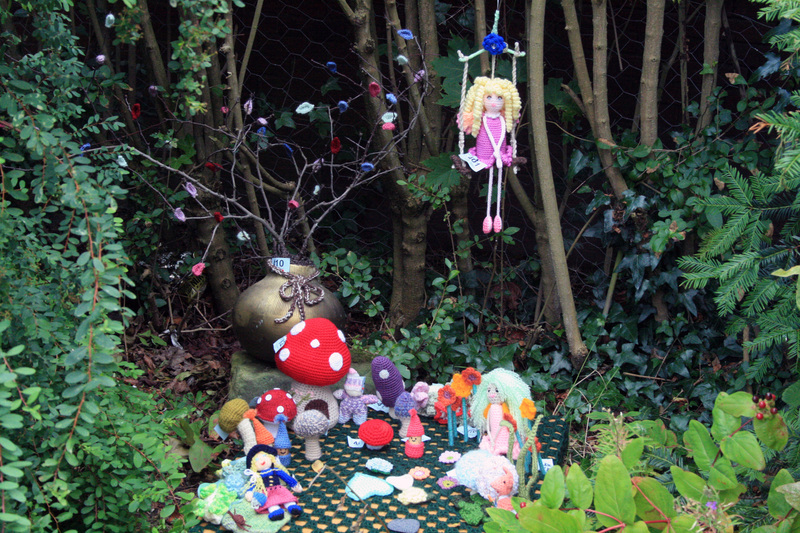 She made the wonderful pennant and ball bunting and the magical giant jellyfish too. Sorry that the light doesn’t show up on the lighthouse but it really does work, honestly, the top lifts off and you just have to press down on the bulb and hey presto, it lights up! With a bulb top and bottom it gave off a good amount of light and drew lots of comments. There was a family of whales swimming above the tiny fishes amongst the seaweed on the far side. 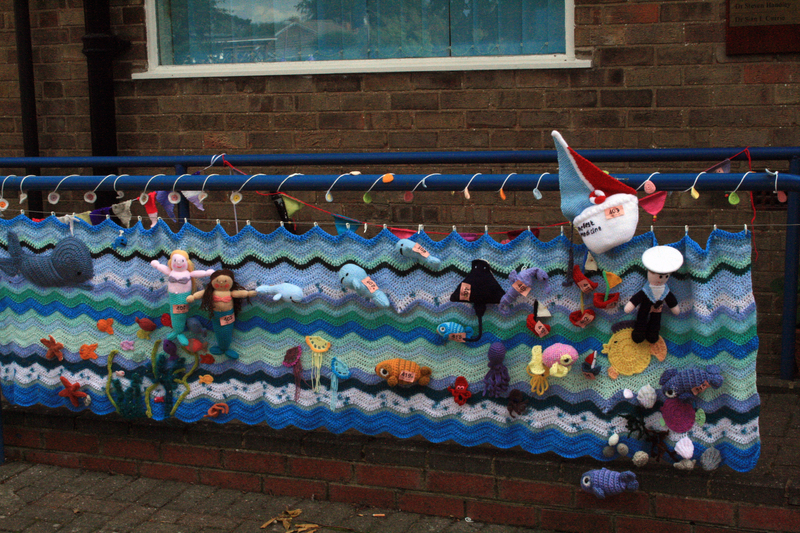 In the centre were more fish, jellyfish and a knitted submarine. 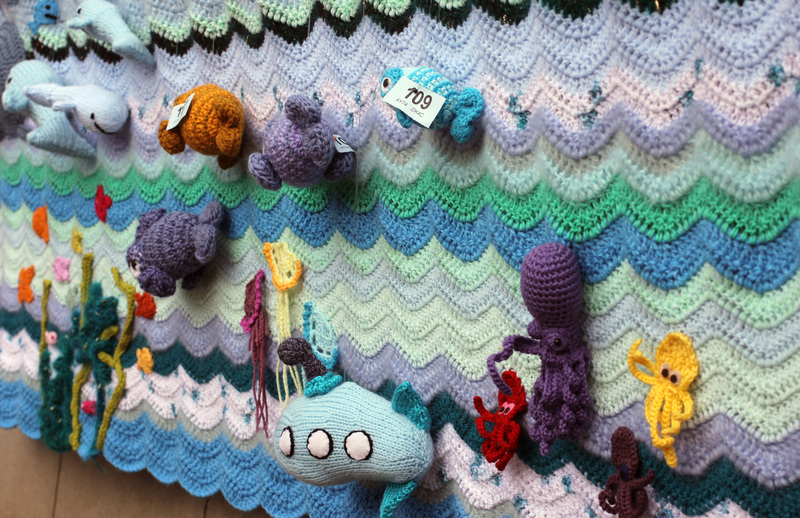 The octopuses occupied the near side of our woolly sea blanket. 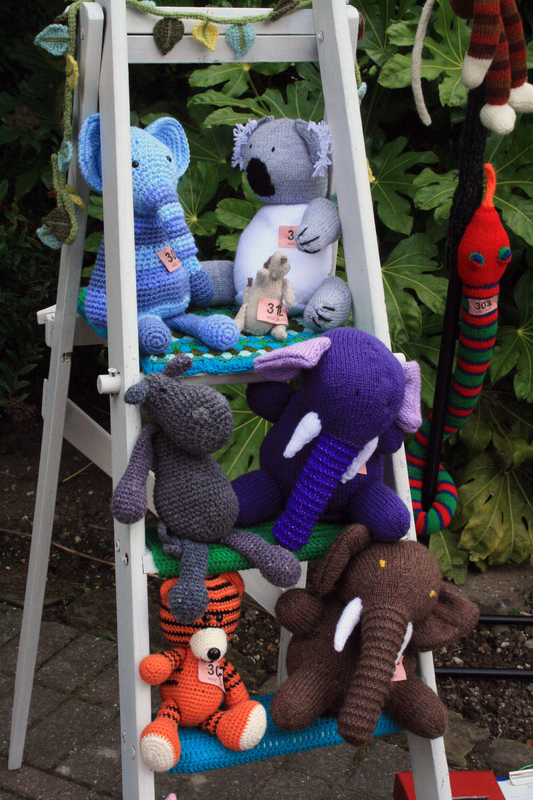 As you can see some of the creatures were stitched into place and others were 3d and hung from the top giving the whole scene a life-like appearance. At the back of the surgery the pond scene worked so well despite a last minute hitch about getting the cover made! 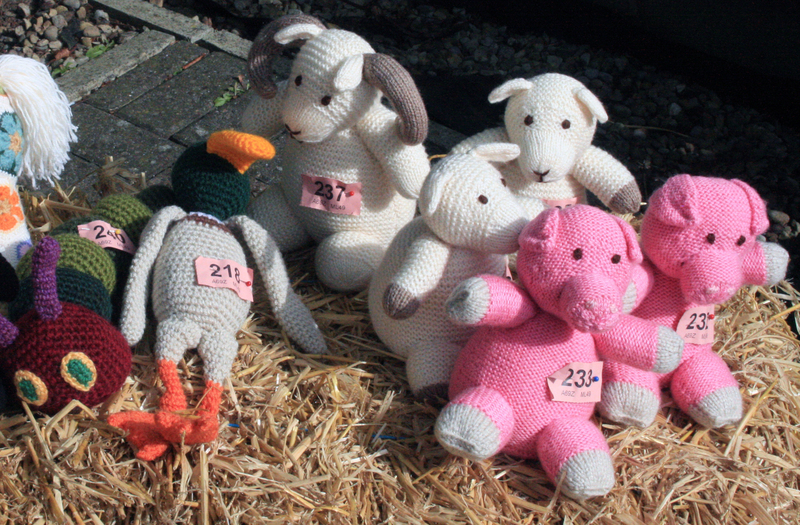 We were very grateful to the local builders who we managed to rope into doing it for us just a week before the event. 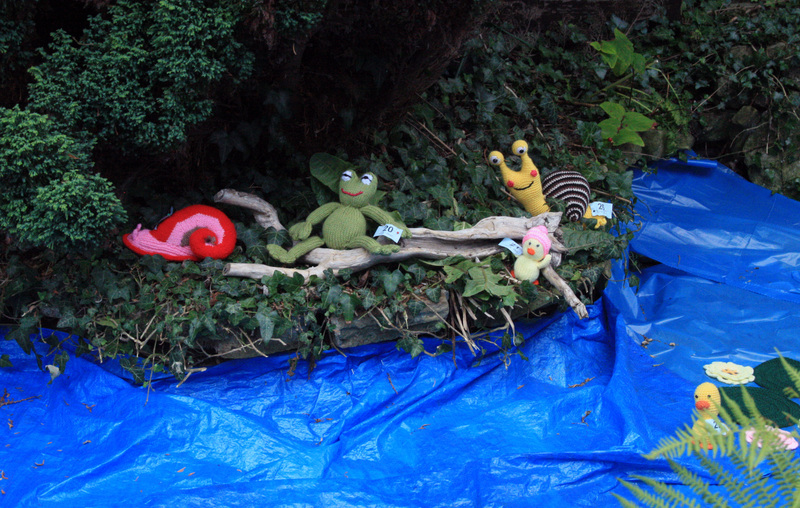 We had little creatures nestling in the undergrowth. 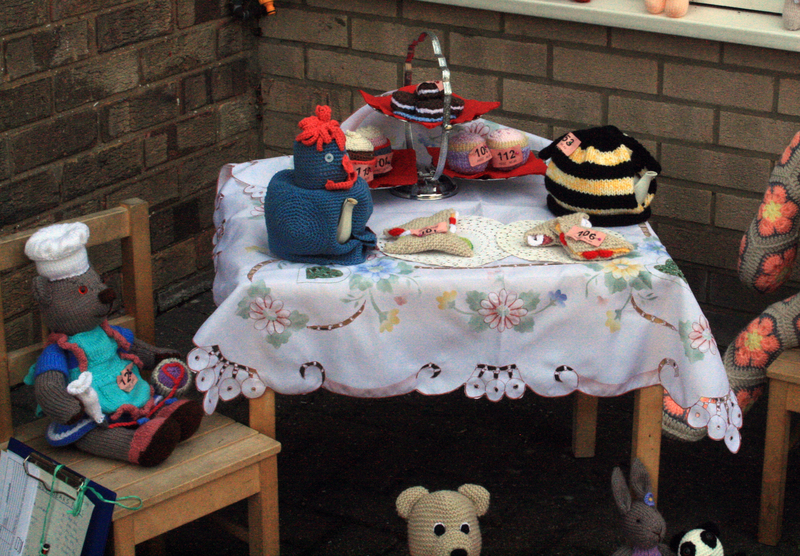 And a tea cosy disguised as a fishing gnome. 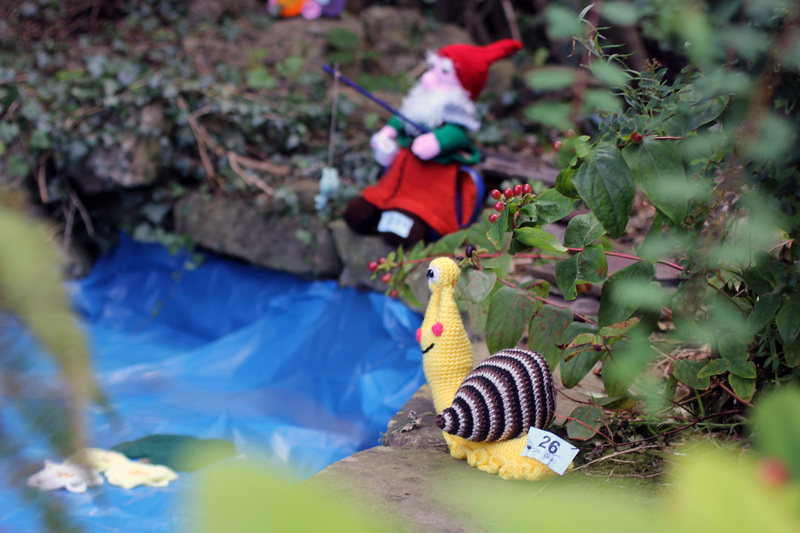 Just around the corner from the pond was the little grotto. 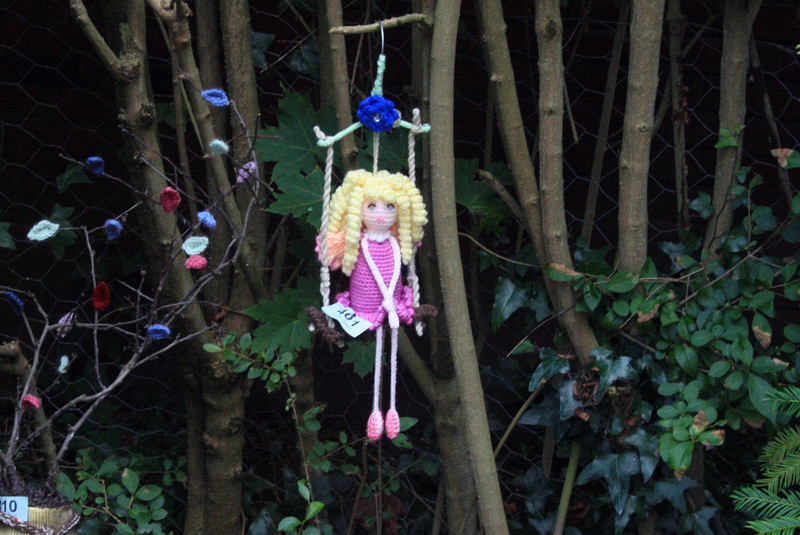 Imogen finally got her wings thanks to Rosemary and she sat primly on her swing overlooking the scene below that was full of taodstools, mushrooms and gnomes. 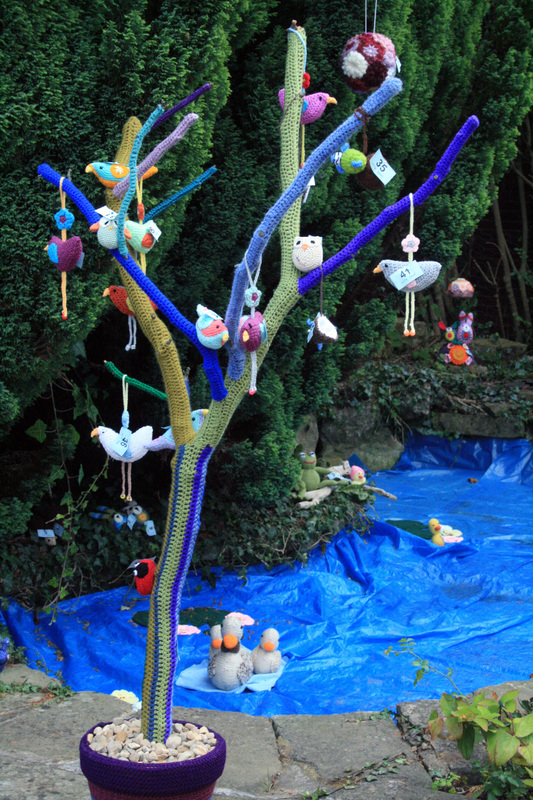 At the front of the pond scene was this amazing tree that was full of little birds. It has found a new home as a window prop in a local shop in town. The pond was home to a little family of ducks that swam amongst the groups of water lillies sent by my lovely Mama H.
And caterpillar was very good and did not nibble into our plants. 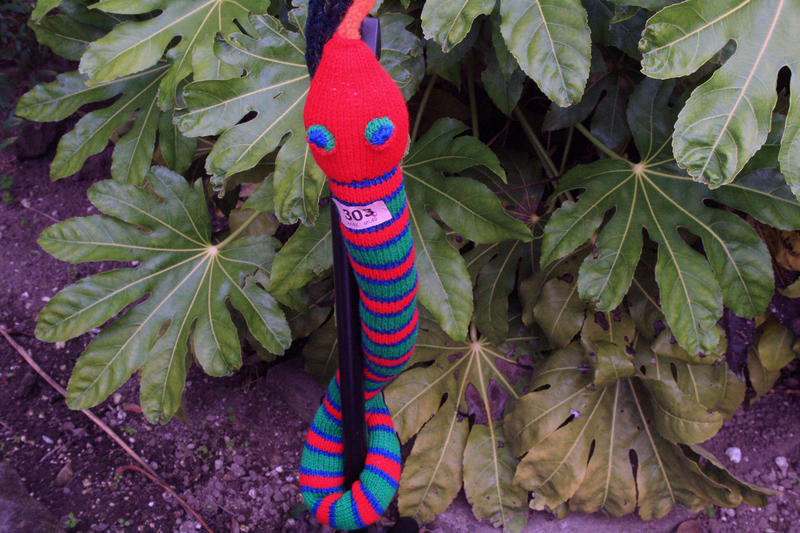 There will be one last post to show you that last of the photos including our safari corner with snakes, monkeys and friends. 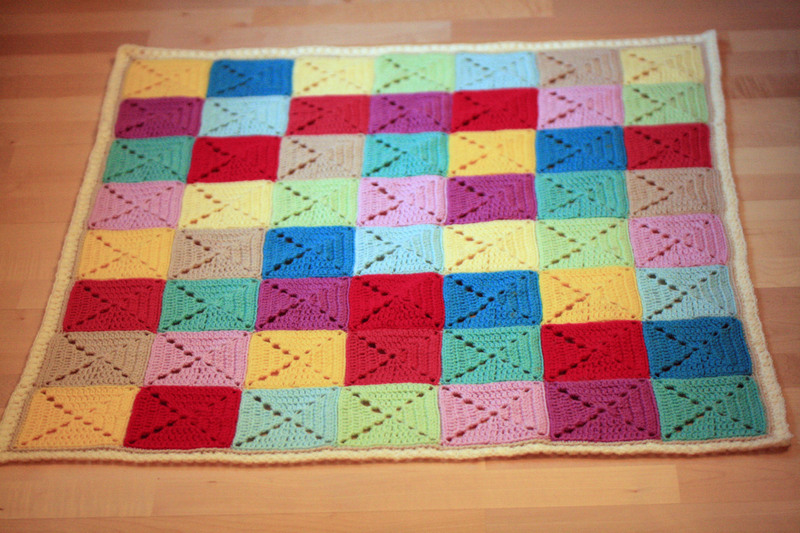 Trying to be good I have used up some left over squares from making my daughters blanket to make her a matching cushion. 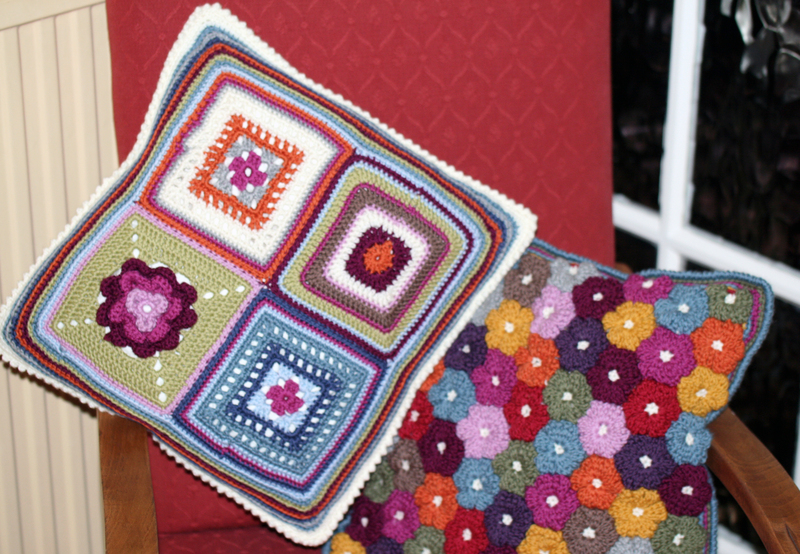 I use the term matching rather loosely as the squares used for the cushion are the patterns that were rejected from the blanket. 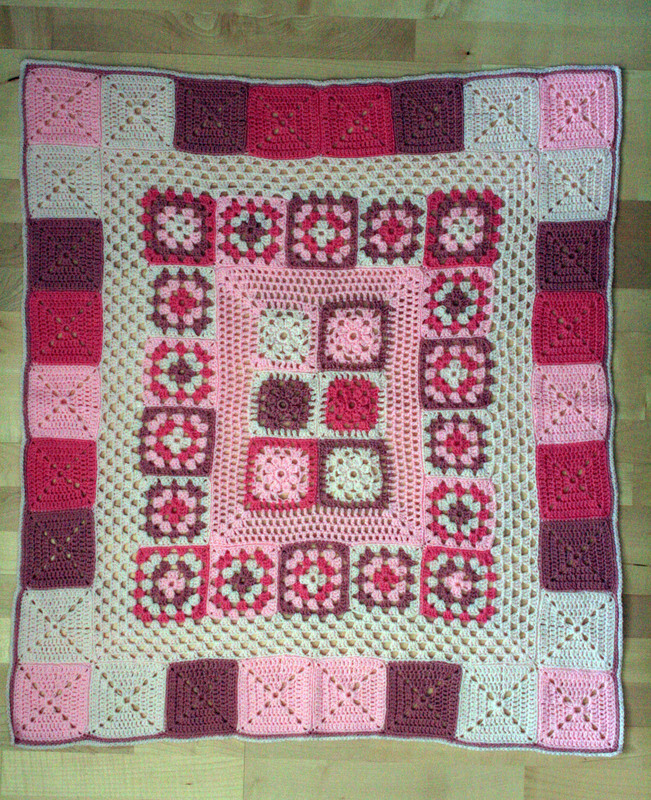 Luckily I had enough squares to make it a double sided affair so she can switch it around as the mood takes her. 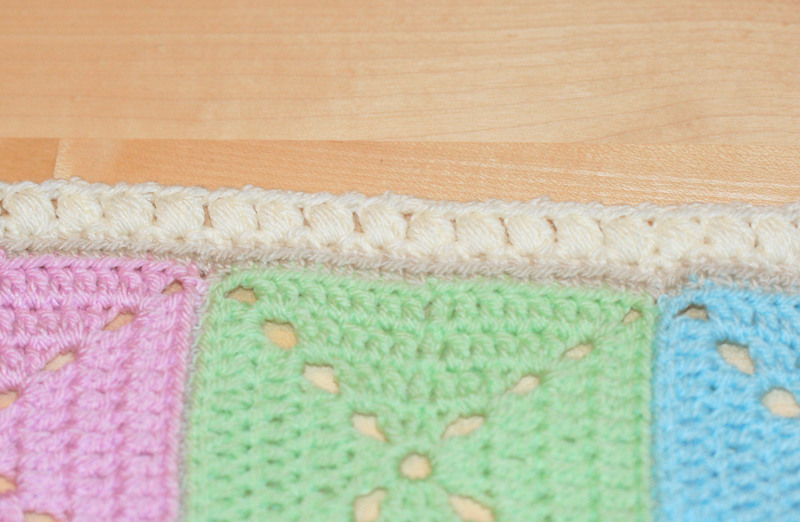 If you want a peek at the full blanket post you can see it here. 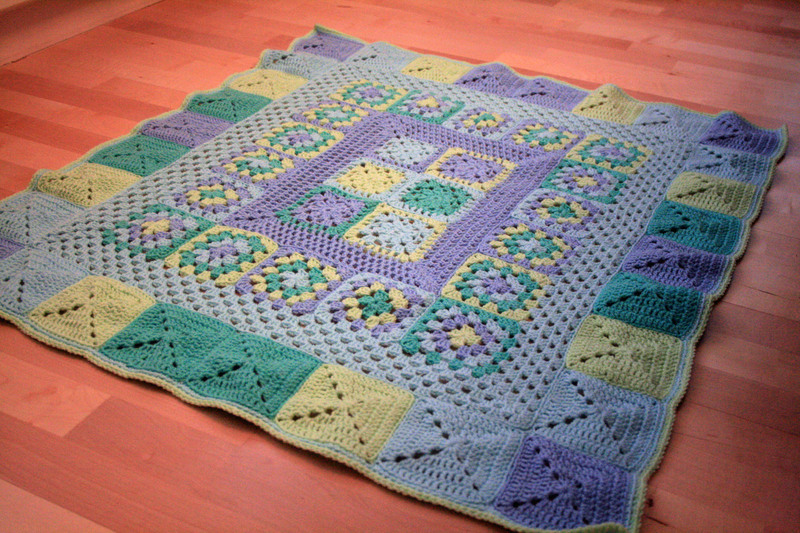 It has been an absolute pleasure making this colourful baby blanket and so quick too. 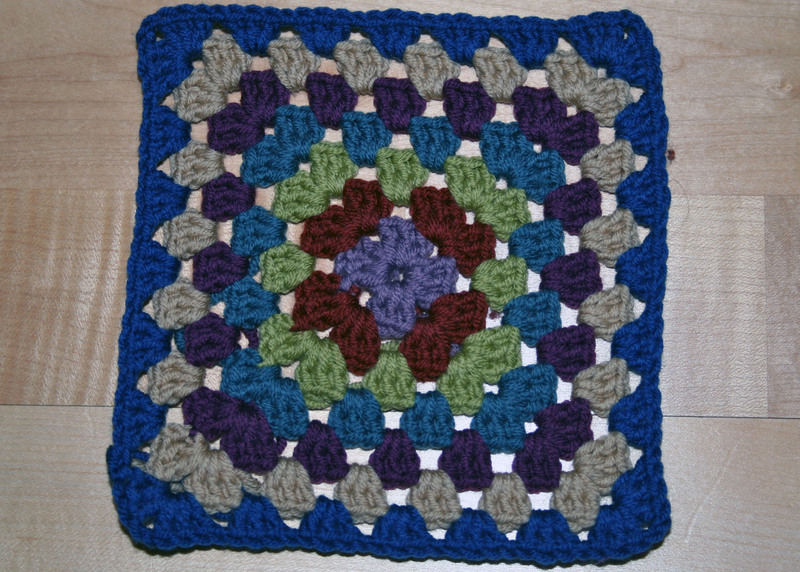 Using the same simple pattern I made 5 squares in each colour from my pay day stash, which incidentally is almost gone now. Then laid them out random style following no pattern what-so- ever, so satisfying. Sorry about the colours, I am having a bit of a camera issue this the evening. this is a mixture of bold and bright colours mixed with a pale pink, blue and beige to provide a contrast. 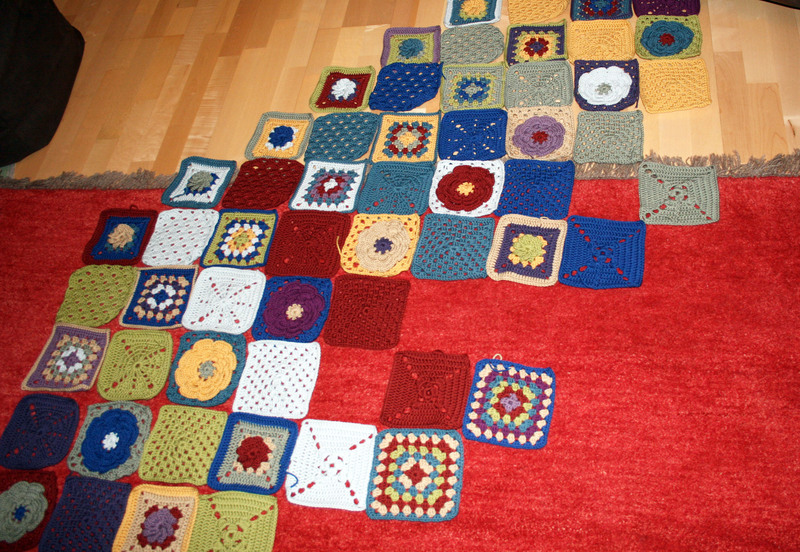 I had almost enough squares but not quite so I laid the balls of yarn out in place of the remaining squares to help me decide which colours I needed to finish. 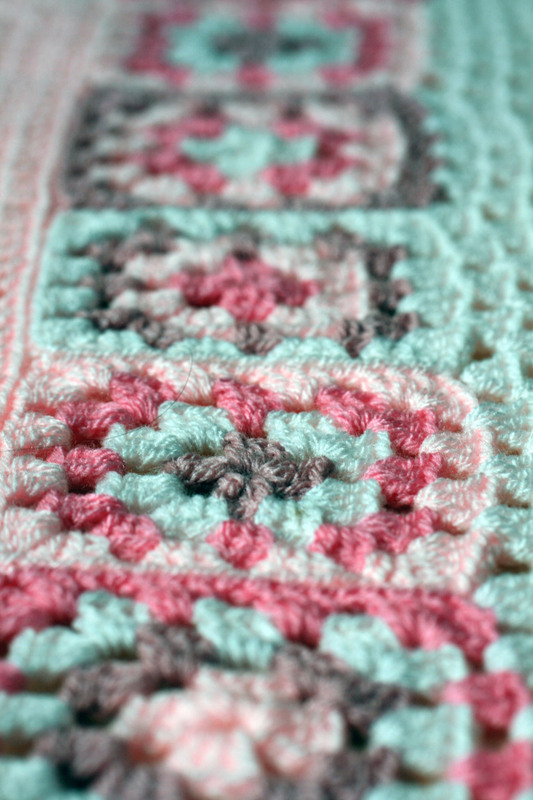 I wanted to try one of the borders from my new book Around The Corner Crochet Borders by Edie Eckman. It is a fabulous book, not only is it packed with a varied range of borders it also explains how to count stitches around you work to make up your own border. 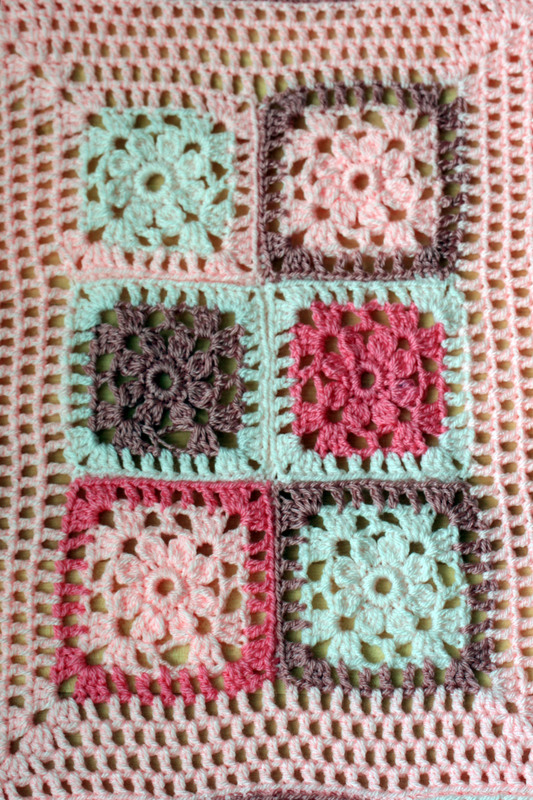 I settled for number 132 on page 269, I liked the way the bobbles reflected the holes formed by the pattern in the squares. Highly recommend this book if you are a blanket or cushion cover maker. 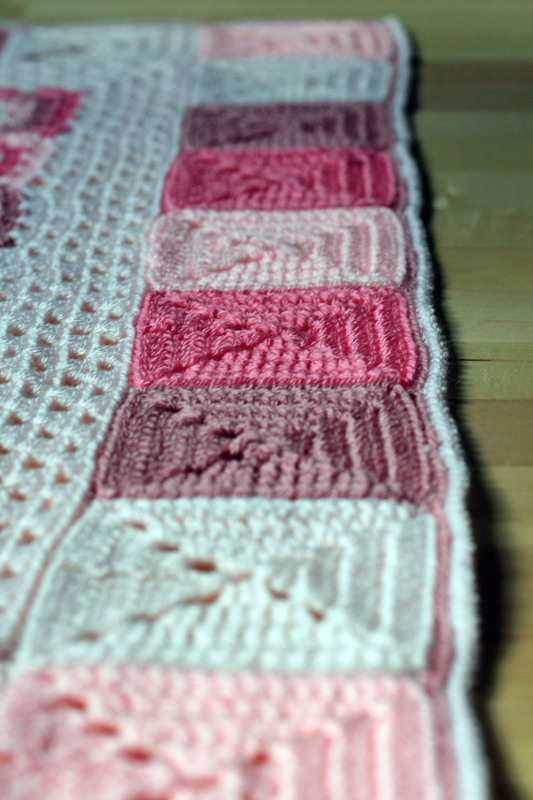 Excited to share more baby blanket news. 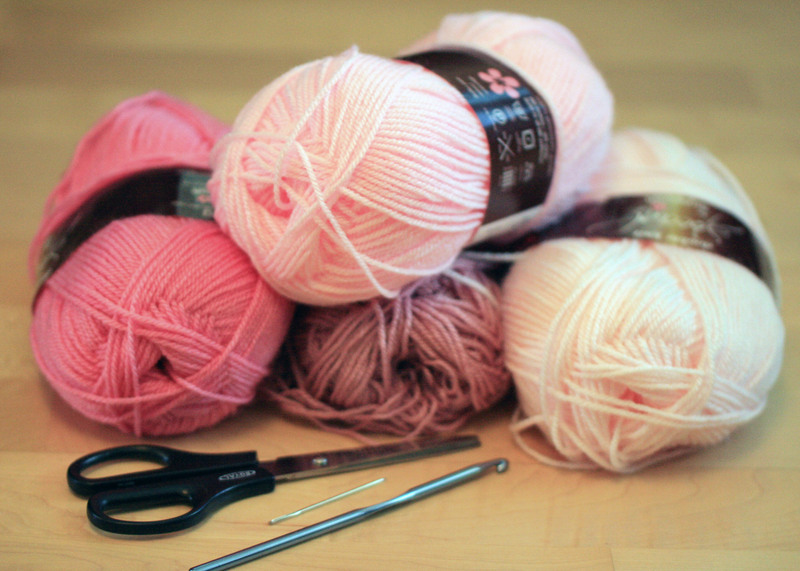 Using the pinks from my recently acquired stash of yarn I set to work. 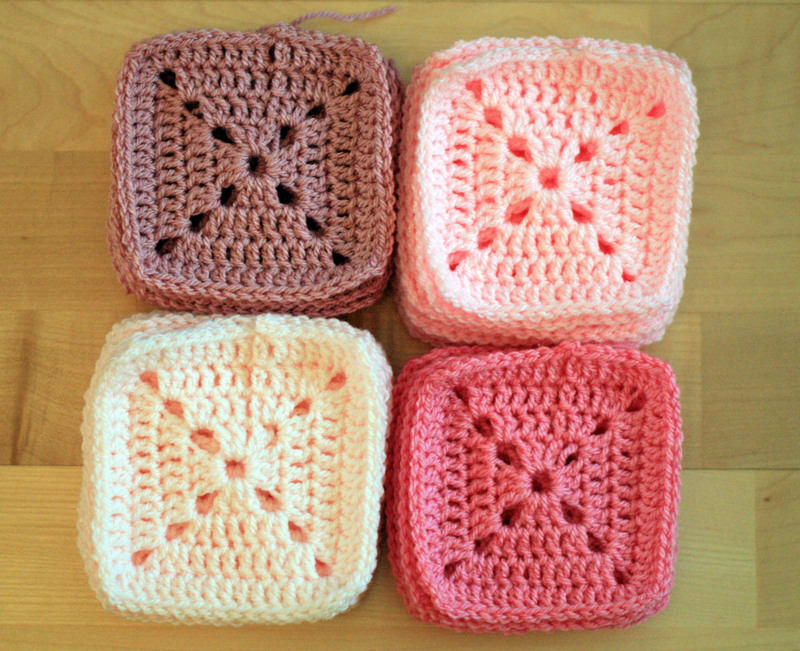 These scrumptious squares make me think of sweet little fondant iced buns. 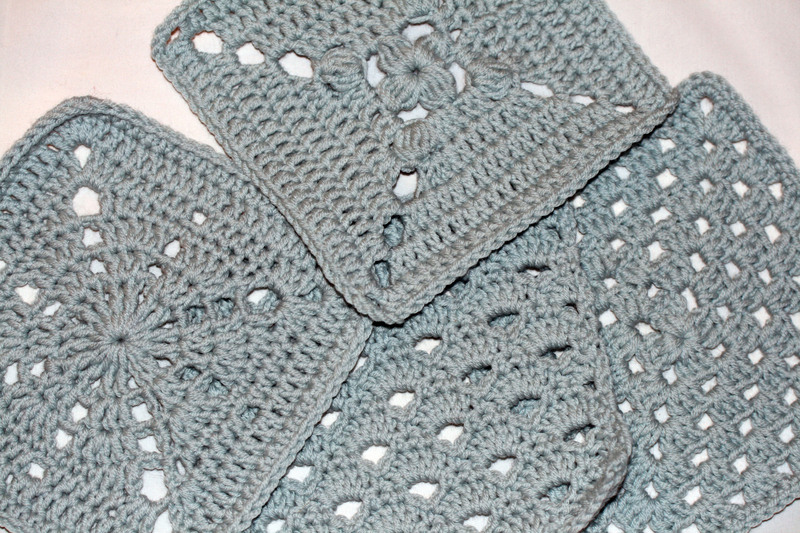 It was easier this time as I was simply following the pattern I devised for the blue baby blanket so I just set straight to it and made a stack of squares for the outer edge. 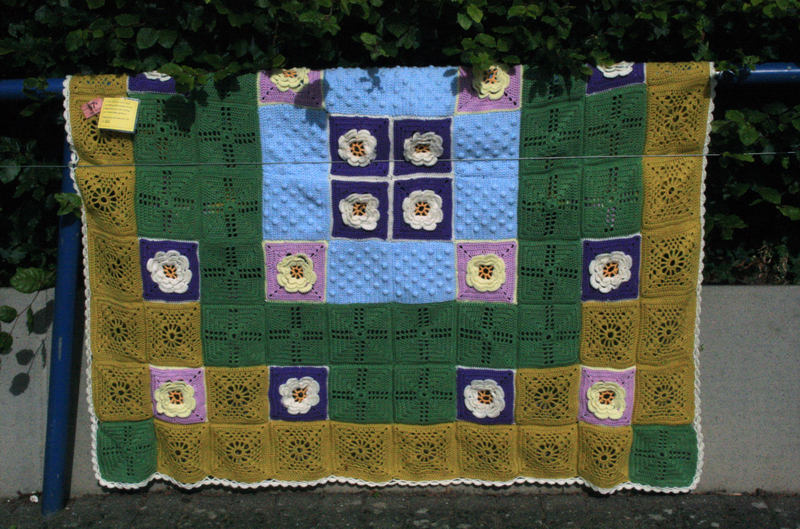 Flower squares for the centre bordered with a simple treble 1 chain 1 border. The simple border in turn surrounded by the old favourite. 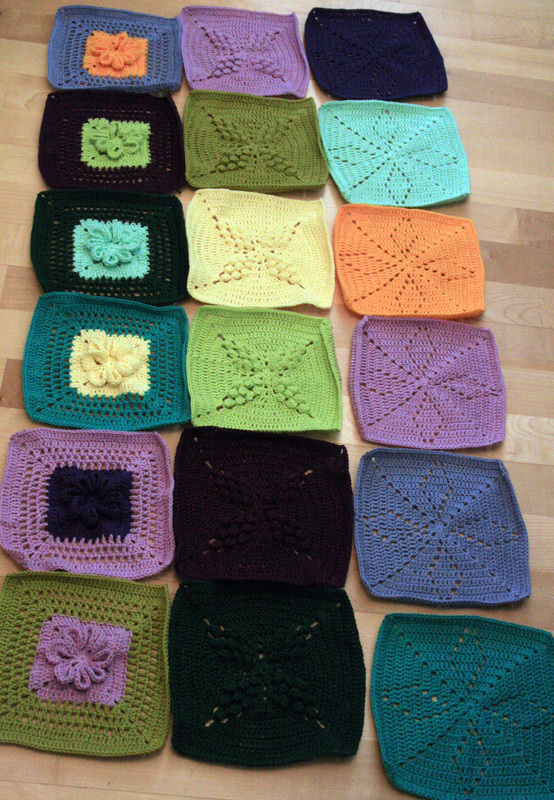 Yes, of course I mean granny squares. 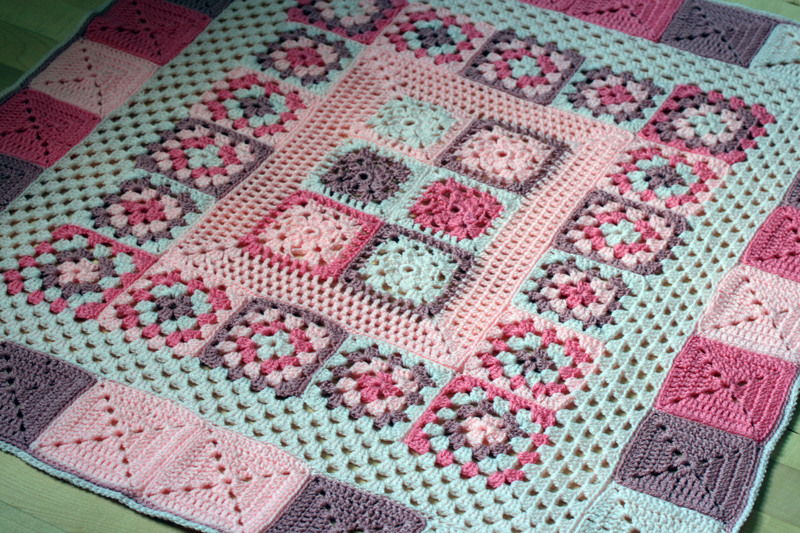 Following the granny style pattern I added a few more rounds in the pale pink, 5 to be precise, before attaching the little fondant fancy squares to form the outer border. And last but not least a couple of rounds of single crochet to finish off. 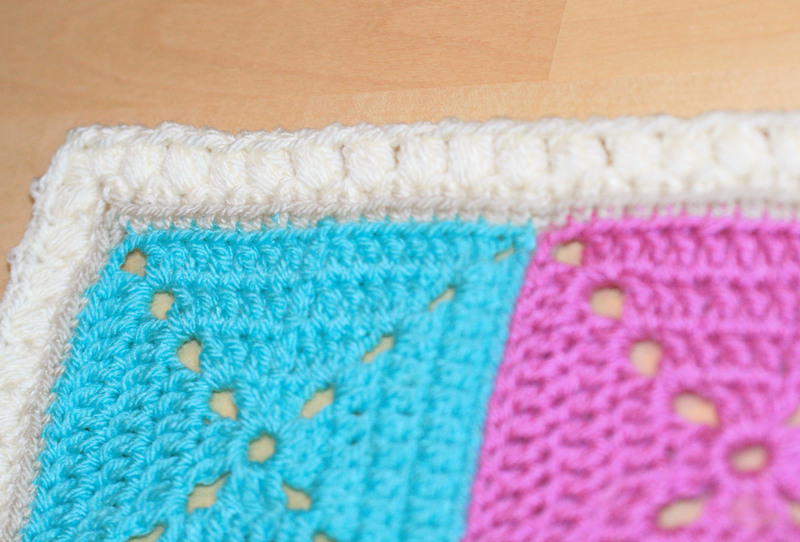 There you have it, a matching pink baby blanket partner for the minty blue one made earlier. Forgive this random addition but I keep seeing so many wonderful photos from people’s gardens I thought I would share my cherry blossom with you too. 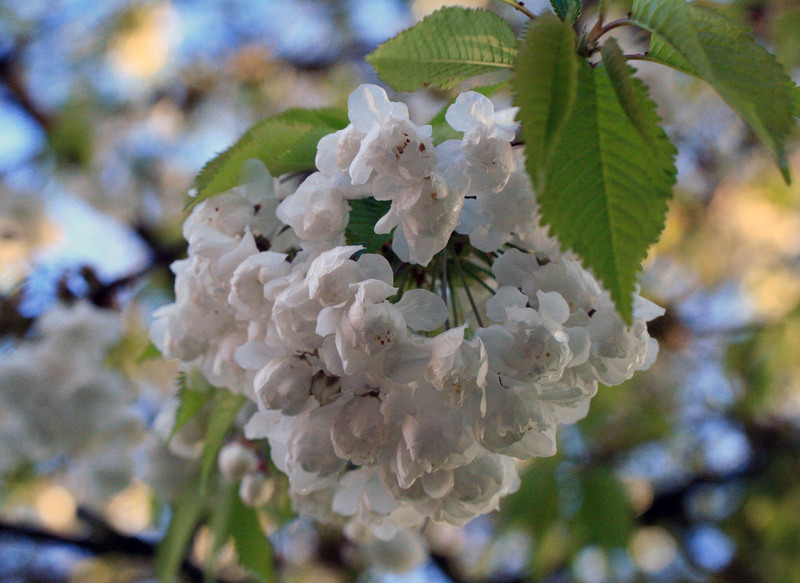 Every spring it gives a spectacular show of blossoms and is one of my favourites in our garden. Sadly these wonderful, but fragile, blooms only last 2 to 3 weeks, and if we get a spell of wet and blustery weather even that can be cut short! It was a bit late this year (a bit like my sharing this image with you) and has shed it’s pale pink petals for this year, so we will just have to enjoy the rest of the garden till it’s time comes again. Just had a mini shopping spree, well why not? It’s the end of the month and I have just received my reward for working hard over the last 4 weeks. 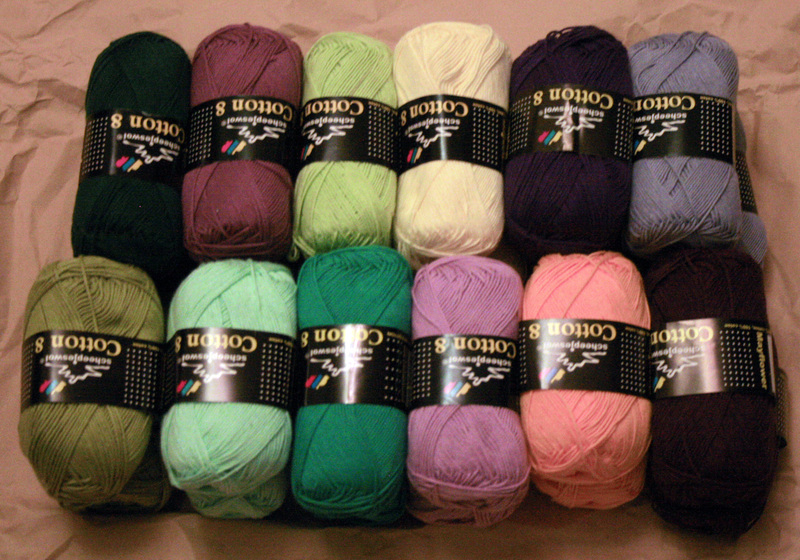 I have treated myself to some yarn to make a couple of baby blankets from this site Deramores, it was recommended by a fellow blogger. They have a great selection but after mulling through for about 10 minutes my yarn of choice was Stylecraft DK, very reasonably priced and a range of 55 lovely colours to choose from. I have selected a range of blues, pinks, greens and yellows in a mixture of soft and muted tones with a neutral cream to link them all together, soooooo excited! 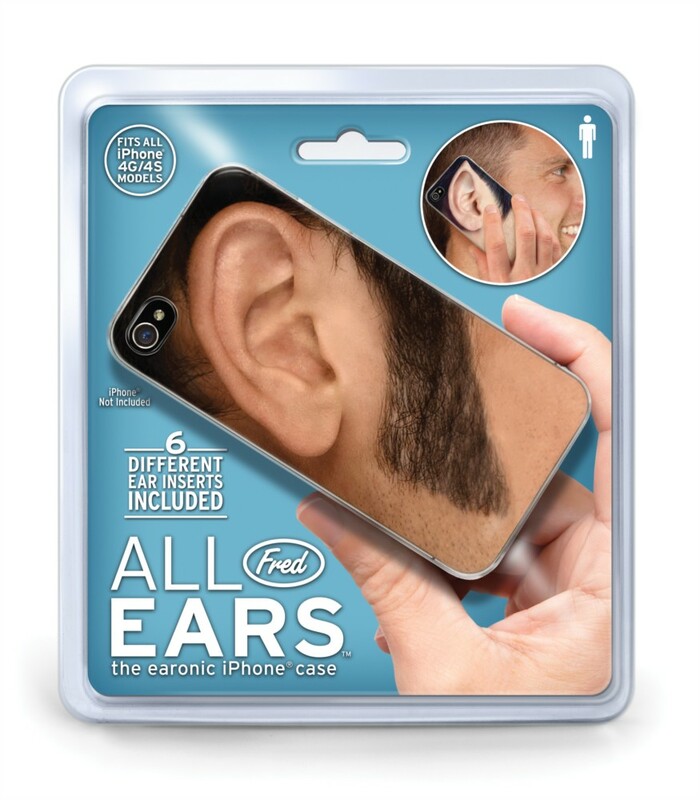 I will take photos and share with you when it arrives. Then when I checked my inbox for confirmation of my order I found an email from The Discovery Store . I bought a few bits from them at Christmas which were all well received so when I saw the offer of 20% off I couldn’t resist a little peek. 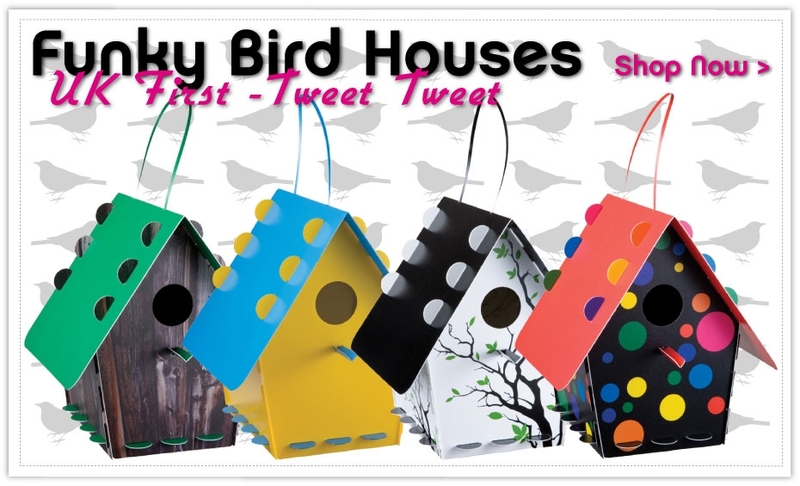 I love these colourful birdhouses. But if I am going to treat myself I will have to get something for my lovely Hubby, mmmmmmm what do you think about this? It will definitely appeal to his sense of humour. Anyway now I have enjoyed a bit of retail therapy I am going to finish off the last of the 4 blankets this evening, just a couple of rounds of edging to do and I should be ready to share a great Tah-da moment with you all! 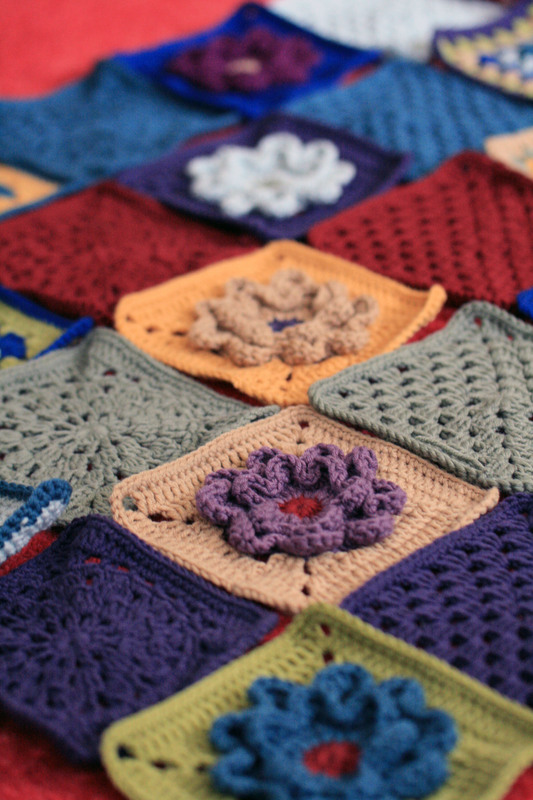 I have been busy making a blanket for each of our 4 children and this is the 4th and final one which is for our eldest daughter, Missy L. I recently posted Multi Flower Squares Crochet Blanket Number 4 of 4 and thought I should give you an update on progress. So here goes! 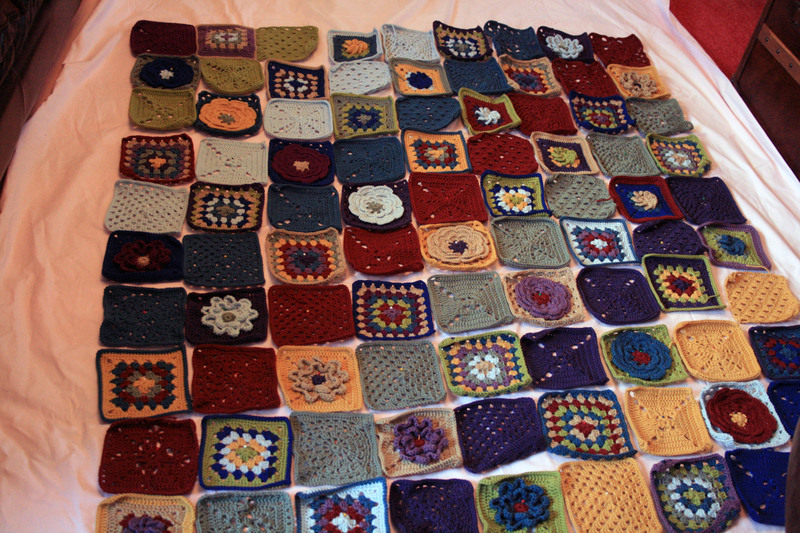 I started making a few squares with no absolutely no idea about the final pattern design, here is my nicely growing stack of squares. 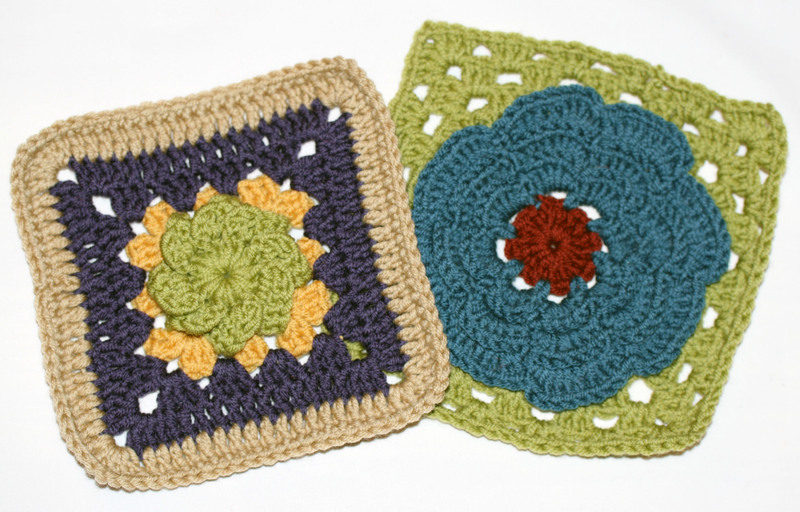 In addition to the squares in the last post I have done some more different patterns for the plain colours. 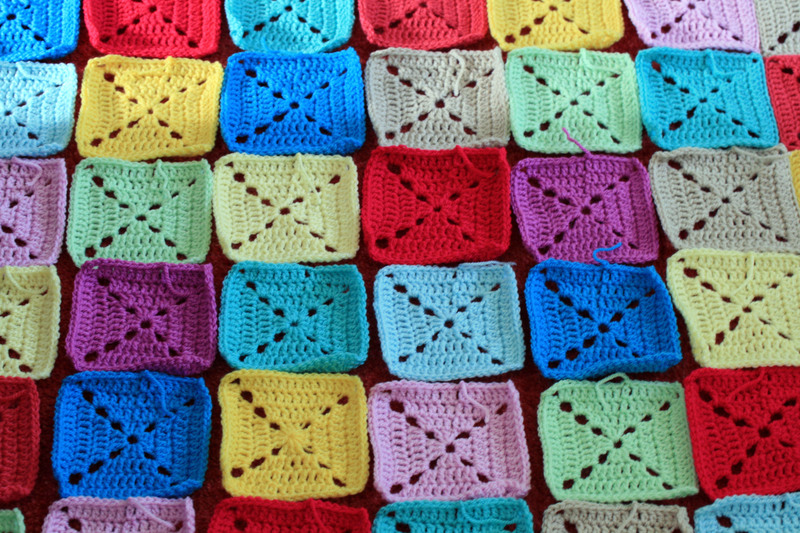 And another variety of Granny Squares, these will be in different colours too. 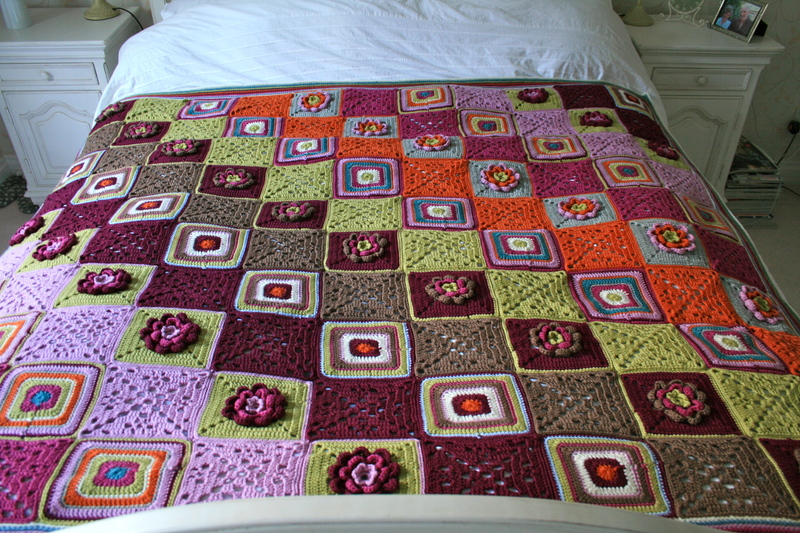 The brief for this blanket was “I love Granny Squares and would like the pattern to be a bit random, ‘hotchpotchy”, which was vague but fine, however I wanted it to have a floral influence and after all I am making it aren’t I? So here are the flower patterns. 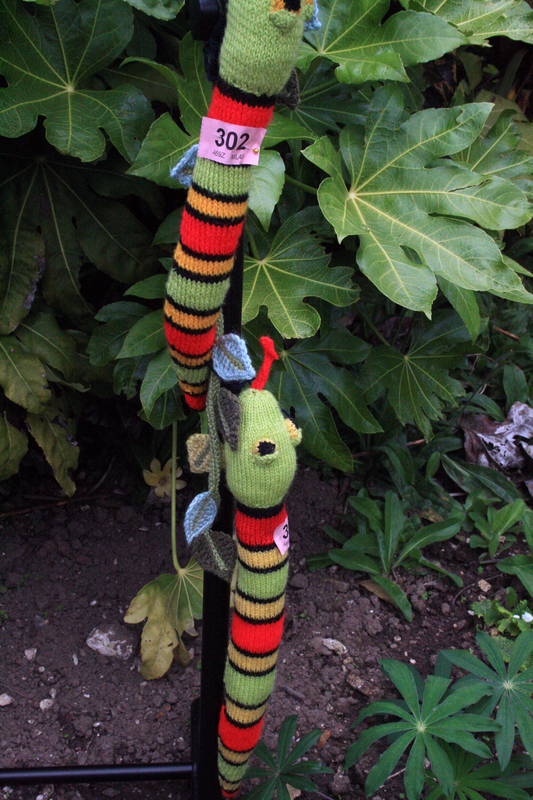 and this one that I have made up myself, really pleased with this one! A tutorial will follow this post. 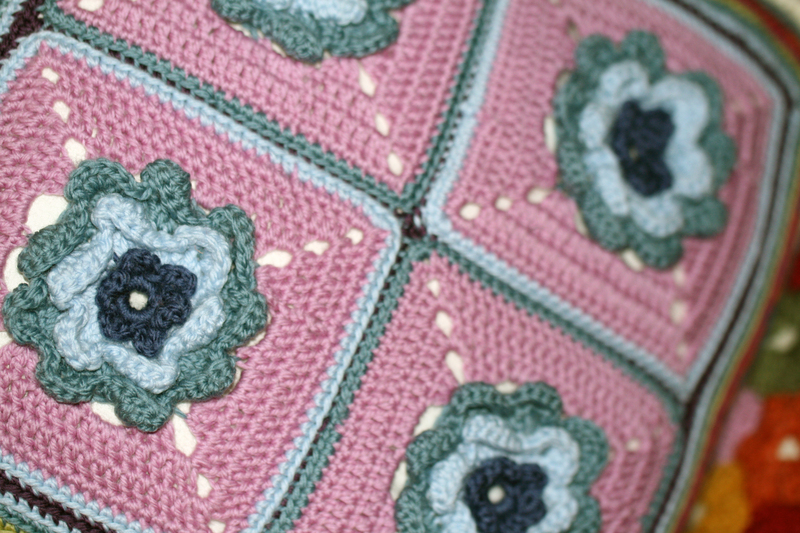 It has been a real challenge to create a pattern that would fit the brief for a random look and include my flowers. I created these two rows first and was really happy with how they looked. 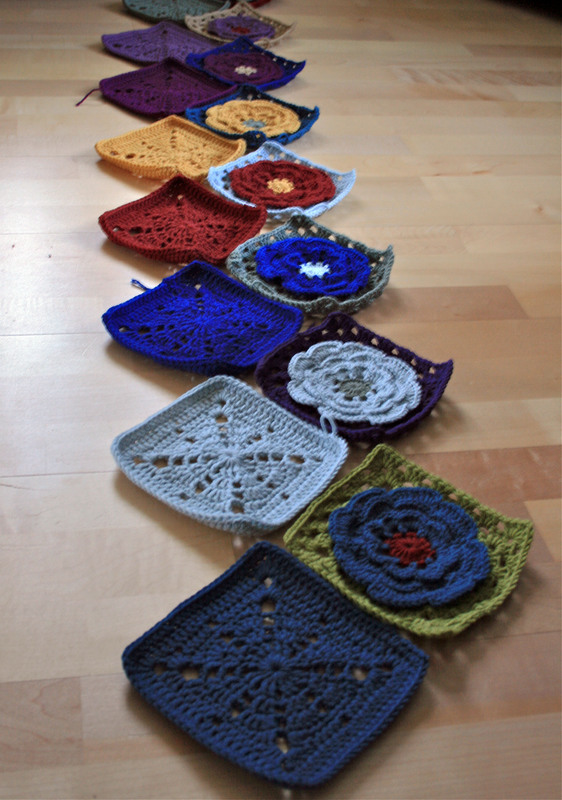 But after making some granny squares and adding them into the mix I started to have doubts. 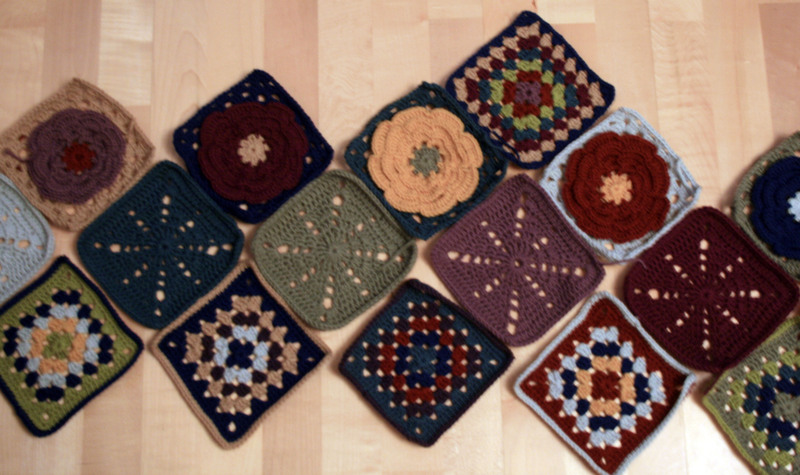 But I resolved to continue making squares and each time I set them out I came up with a different formation. Oh dear, I started to get really worried that this project was not going well. I was simply not feeling it, you know how it is when your developing a project, you just instinctively know that something is not right, the colour balance is out. 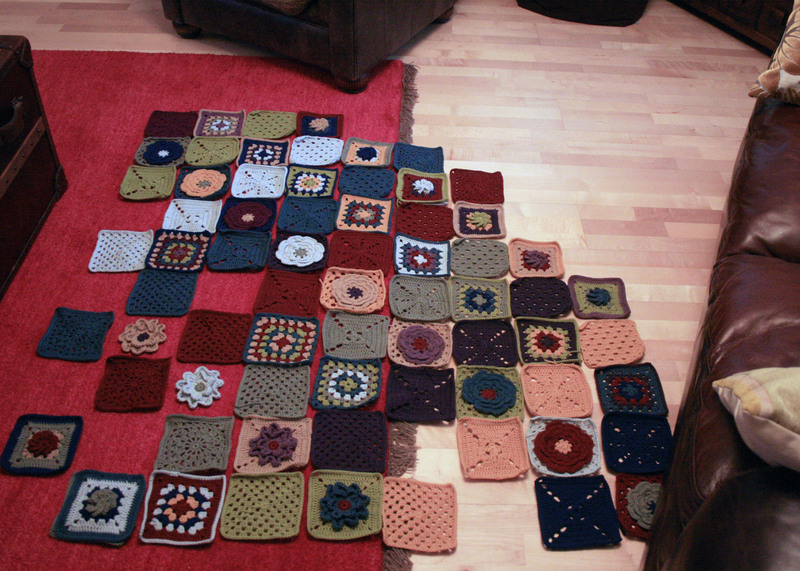 Then one evening I got out the squares again and set about laying them out and at last it started to fall into place. I realised that a totally random selection would be difficult to make work and that it needed some kind of sequence. There are 2 sequences at work in this pattern and both include order and a randomness. Working diagonally from bottom left to top right are the plain colours, order comes from being the same colour, randomness from each square being a different pattern. 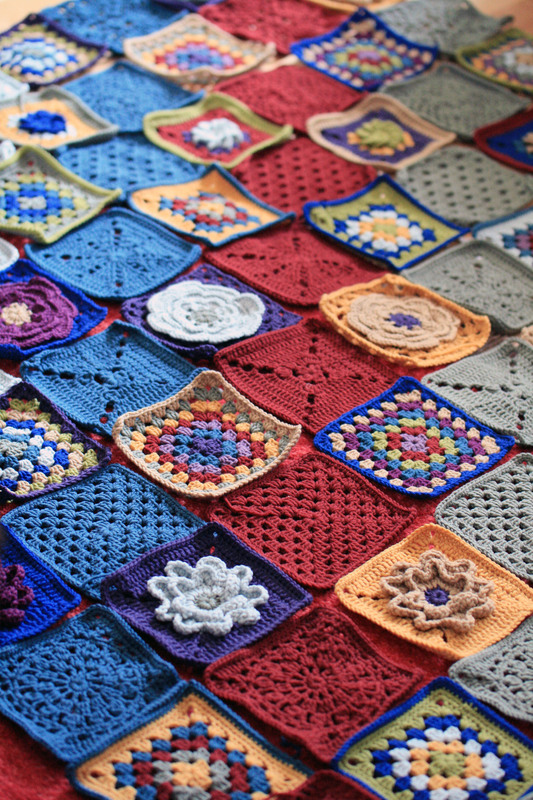 Working from bottom right to top left are the flower and granny squares, here order is represented by the same pattern being repeated but the use of different colours provides the random feature. Now all the gaps are filled in it looks like this. You can see the pattern sequence more easily now all the squares are there. 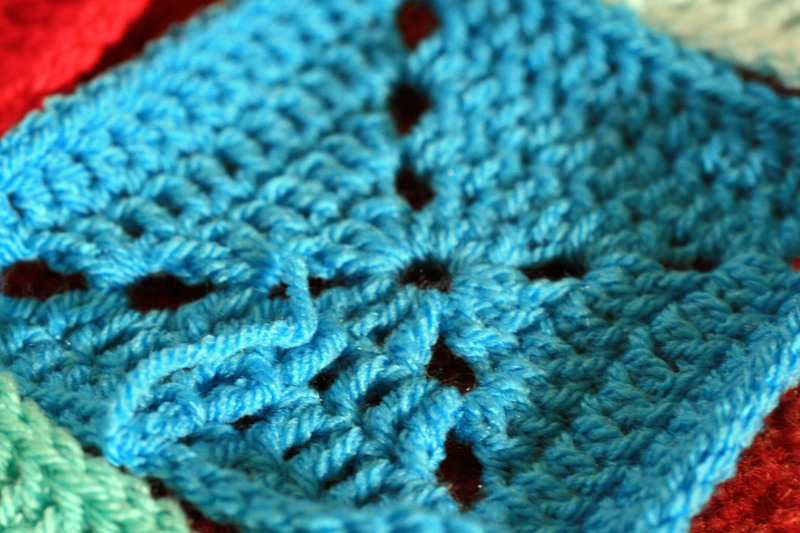 Now I am really happy this is going to work into a real fine blanket. 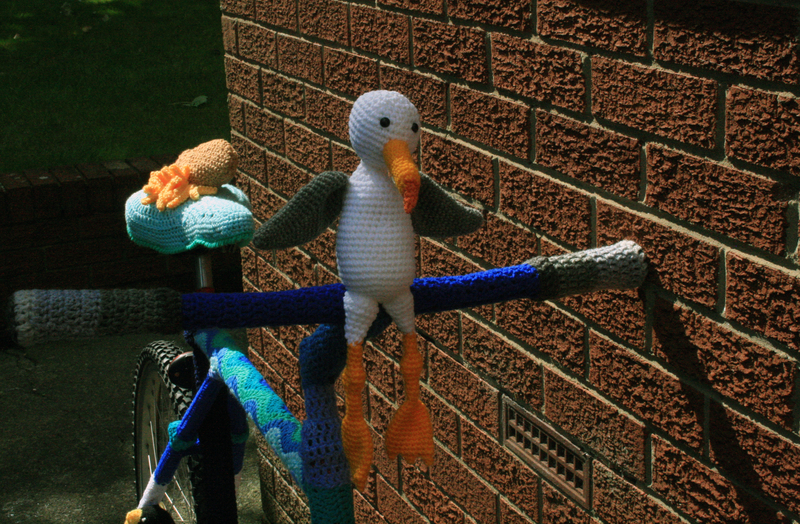 All I have to do now is crochet them all together and add the border then I can share the ta dah moment with you.